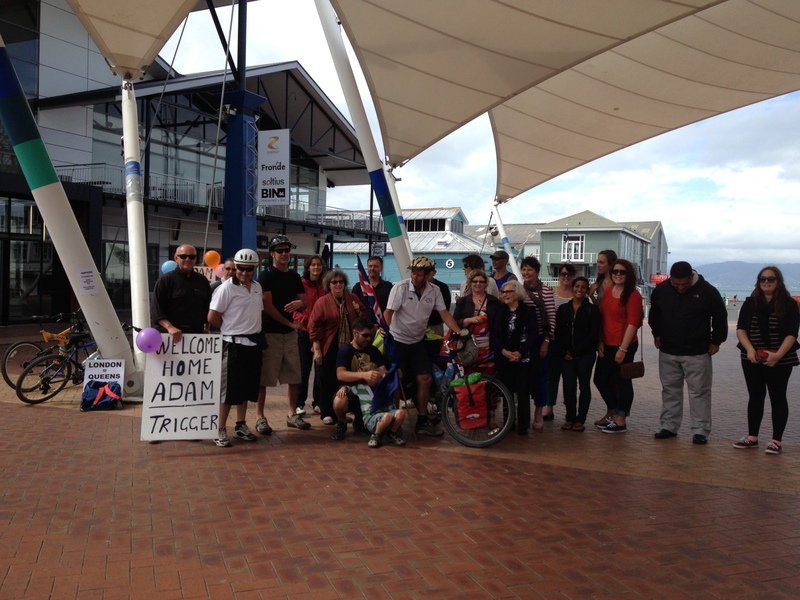 Finish line: Queens Wharf , Wellington – Saturday 9th March 2013 at 3 p.m.
Was planning to make an early start. But it never happens when you are staying at someone’s house. Finally got moving just after 8:30 a.m. Traffic wasn’t too bad. It took about 16 km to get out into the country and onto country roads. These roads were really quiet. I got slightly lost coming out of the city. 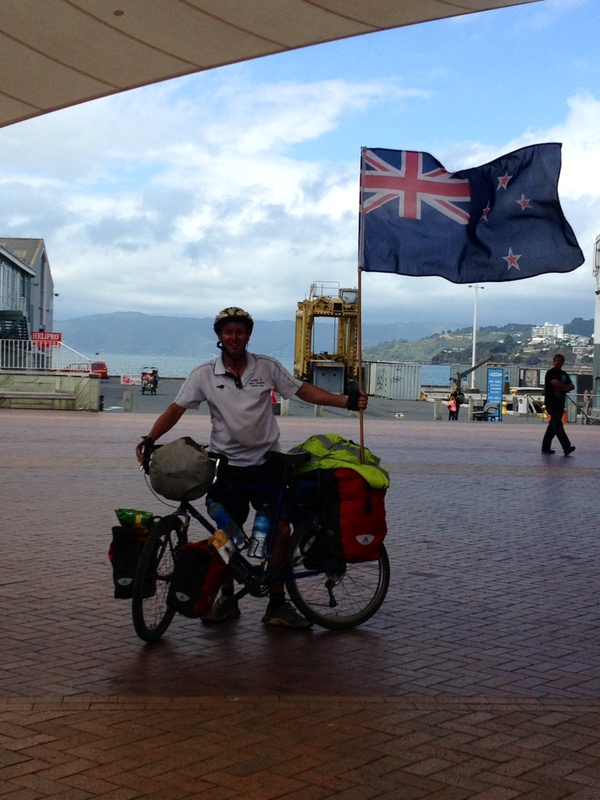 It was nice to see the people of New Zealand are just as helpful as the many other countries I have cycled through. I was stopped on a corner and a guy jumped out of his car and walked back to me and asked if I needed any help. It has happened a few times now. Completely by coincidence……. I was partly lost and ended up cycling past the school where Steve teaches. 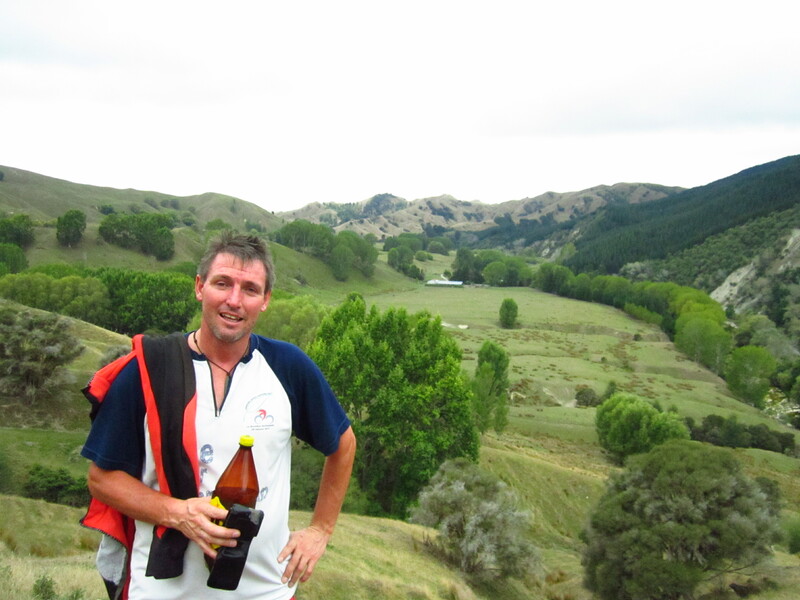 It wasn’t long before I discovered New Zealand has hills too, with some nice steep climbs. But it was beautiful cycling through the countryside. Shades of green and shades of brown after a long dry summer. 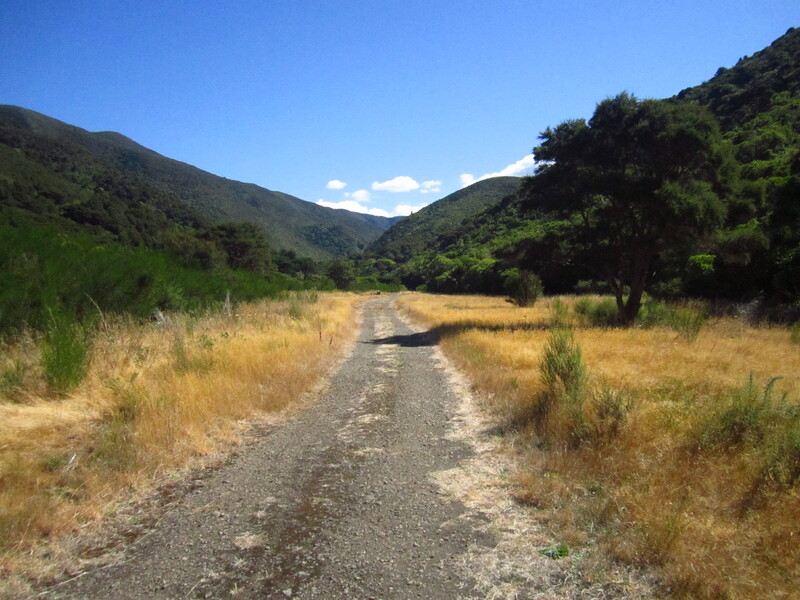 Cycling through pockets of native bush full of ferns is the New Zealand I had almost forgotten. 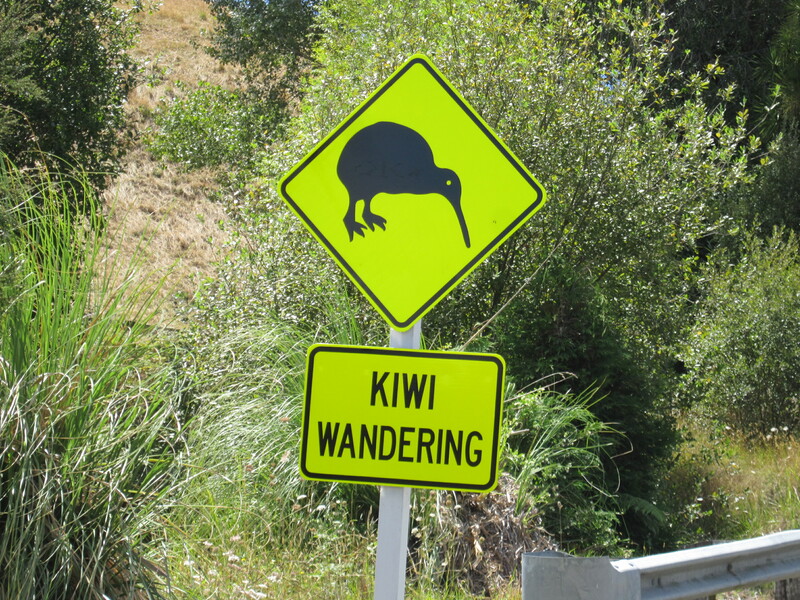 I am now discovering parts of New Zealand I hadn’t previously visited. After about 45 km I came down into the firth of Thames and cycled along the coast for a while. Hardly anyone around. The beaches deserted. After lunch I did a telephone interview with James from the BOP Times. It’s nice to start drumming up some publicity which has been nicely arranged by Janet who has been very pro-active. My new t-shirt is also doing the trick. Loads of people are stopping to read it and it is creating lots of positive feedback. It was a hot afternoon and I found the going a bit tough after not really cycling for over a month. I had to have a few breaks. The last one was a quick sleep on the porch of the country kitchen between 5 – 5.30 p.m……………by this time I was feeling exhausted. I have started using an internet site called Warm Showers which is for cyclists to use to find free accommodation all around the world. I thought I had a place lined up but on this occasion it went a bit pear-shape. After corresponding by email it fell apart when I tried to contact my host by phone……….not panicking I cycled into Thames, went to McDonald’s for dinner and the supermarket for a cold drink. New Zealand! So proud that you are keeping the hospitality line going and I can say its equal to anywhere……….except maybe Iran which will always be hard to beat. 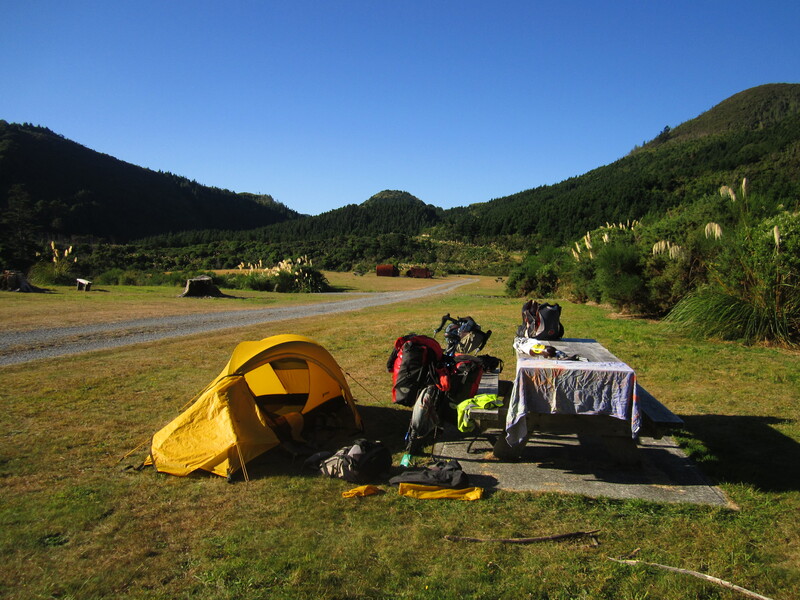 So after a nice shower and a cup of tea and a bit of a chat with my hosts J, Dan and Adrianna I had my first night in a tent in New Zealand. 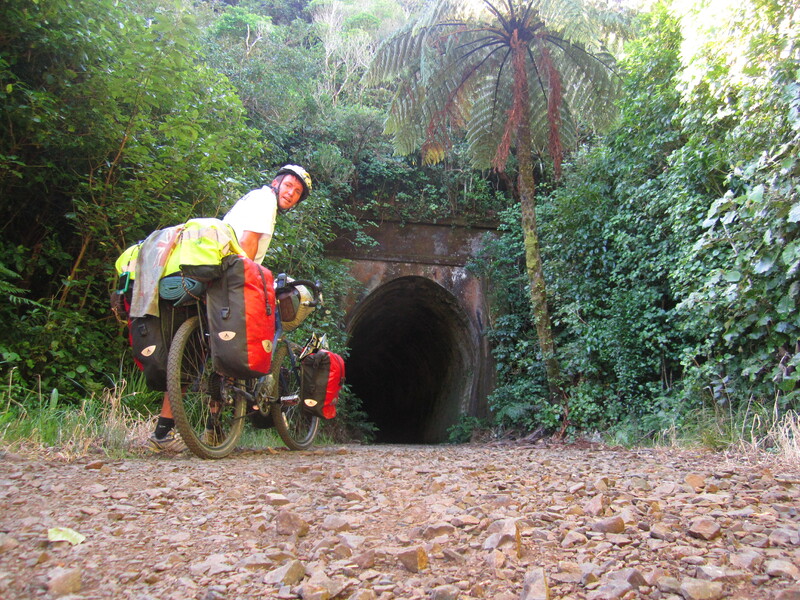 For the next few days I am going to follow the Hauraki Rail trail. But before I picked up the trail I had a little look around Thames. Similar to small towns in Australia. There are still a number of old buildings from before the turn of last century scattered along the main street. The old police station and court house now residential property. With only 60 odd kms to Te Aroha I really took my time. My first stop was after only 11 km at the Matatoki Cheese factory. I stopped for a coffee and found myself chatting to quite a few people. 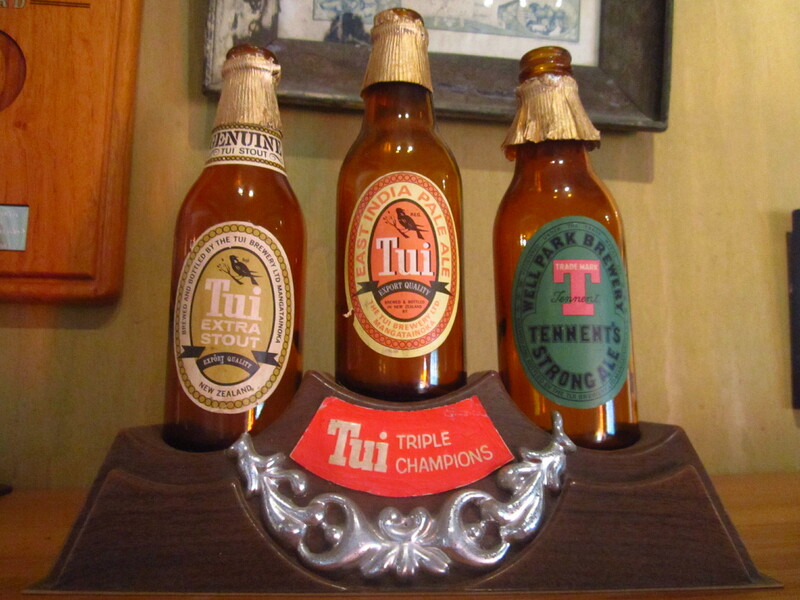 As a result I have been told to go and visit a friend of a friend for somewhere to stay in Opotiki. 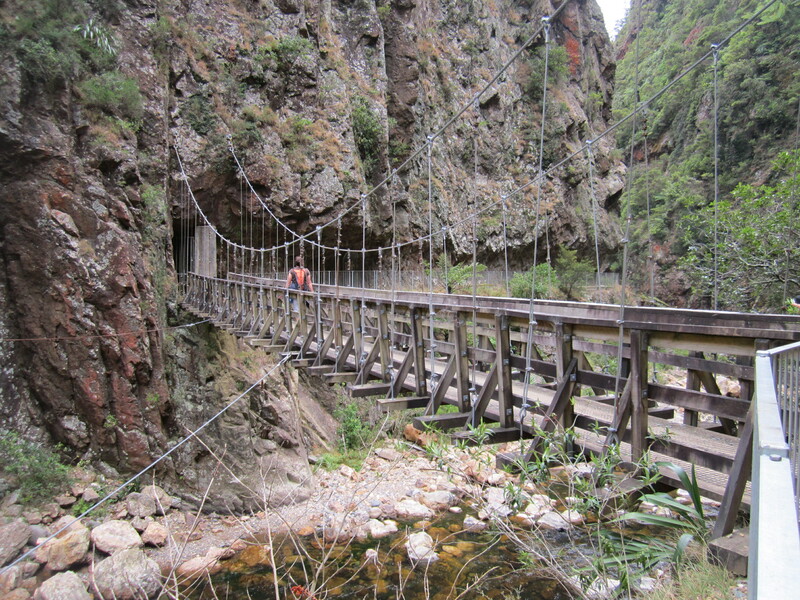 The cycle trail runs through rolling country side with paddocks full of cows and the odd sheep.The trail is gravel and goes over a few swinging bridges. I stopped for a late lunch at the Convenient Cow at Huakini. Nearby was an old factory now in ruins and wrecks of 1950 delivery trucks. 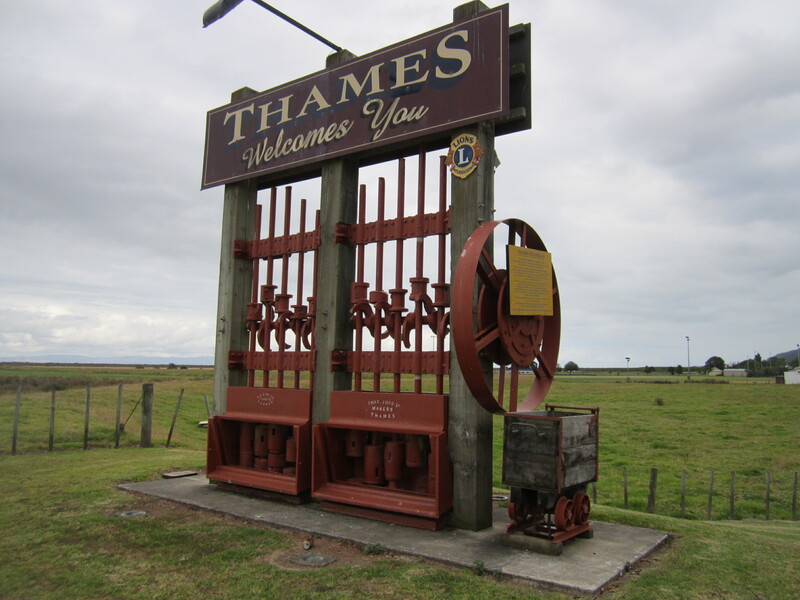 The old railway line passed through Paeroa. 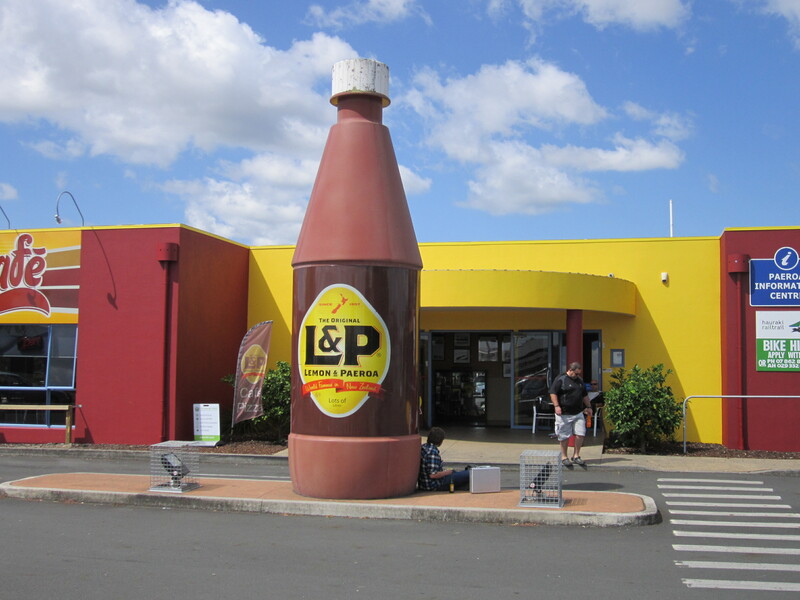 Famous for the drink Lemon and Paeroa. Warm showers was a bit more successful tonight and I was able to camp on the lawn of Anita and Chris who were lovely hosts. Anita kindly ensured that I left this morning with some lemon slice for my morning tea. 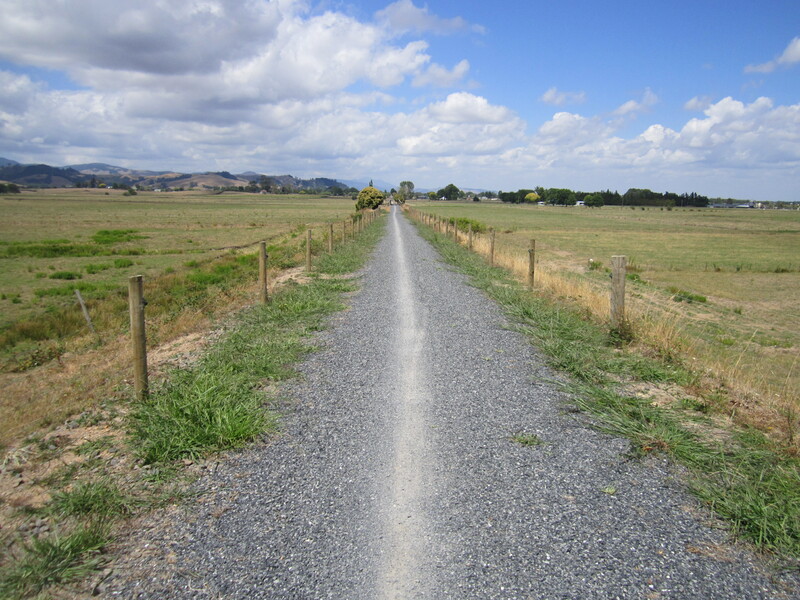 I cycled along the road straight back to Paeroa before I rejoined the branch of the rail trail that now heads to Waihi. 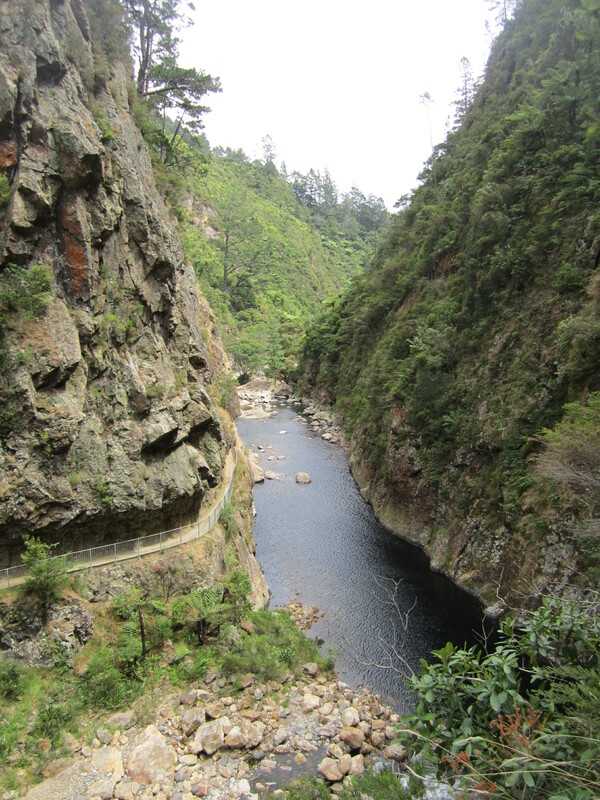 It was awesome as the cycle trail went through the gorge next to a river. 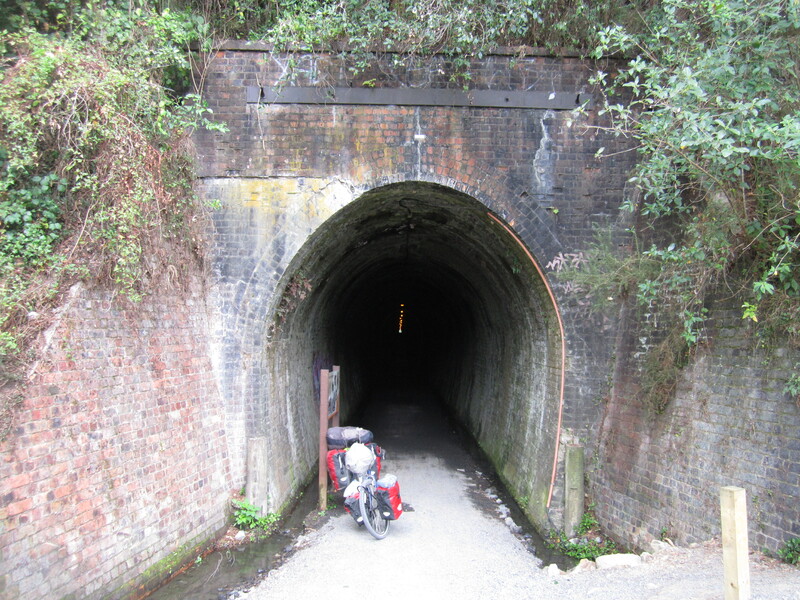 At one point there was a 1.1 km old railway tunnel to cycle through. This area is full of old abandoned gold mines that were started over 100 years ago. All along the gorge were relics left over from that time with lots of concrete foundations and bits of cast iron machinery. There were lots of old mine tunnels you could walk through. Very dark and difficult without a torch. The tracks from the old carts which used to transfer the material were still visible. A lot of things were overgrown by the bush and you would only notice them if you looked closely. It was a very nice area to explore. Further up the valley I came across the old cyanide tanks used to separate the gold. It was a very interesting place to explore. For the last 7 km into Waihi I had to cycle on the road but it wasn’t too bad. 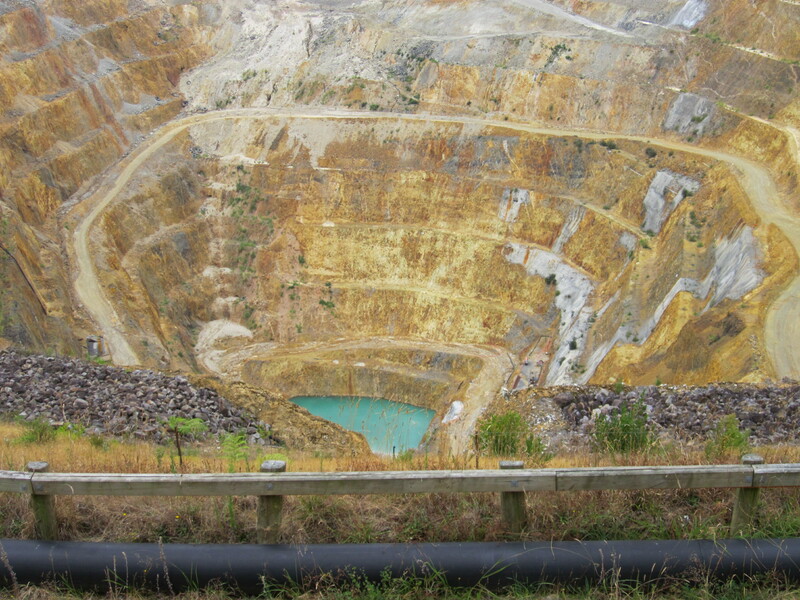 In Waihi there is an open cast mine just 200 meters from the main street. You can’t see it at first because it is up the hill slightly. You get a good view from the top and it is a deep deep hole with a very blue lake at the bottom. You can watch them working but they all look like ants. I cycled 5 km around the rim of the pit. 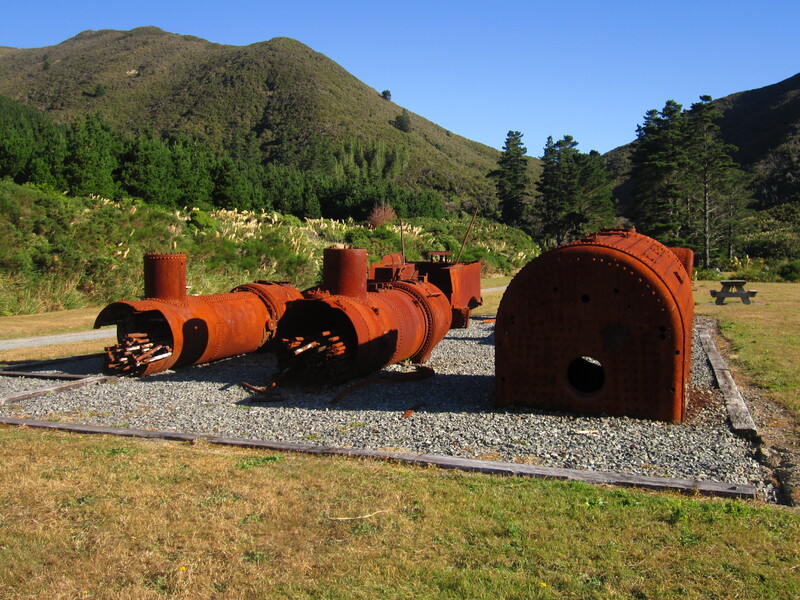 It was bit of an open air museum with old dump trucks on display and other mining things from the past. Light rain started to set in half-way round. I saw it off spending some time in the information centre before I went up to the motor camp and pitched a tent there for the night down by the stream. Got eaten alive by sand flies. I am getting lazy as I had fish and chips again for dinner instead of cooking. I am continuing to have late starts since arriving in New Zealand. It’s nice taking it easy in the morning. The downside is that the day seems to go so much quicker. The road to Tauranga was busy. Traffic was heavy and not that pleasant. 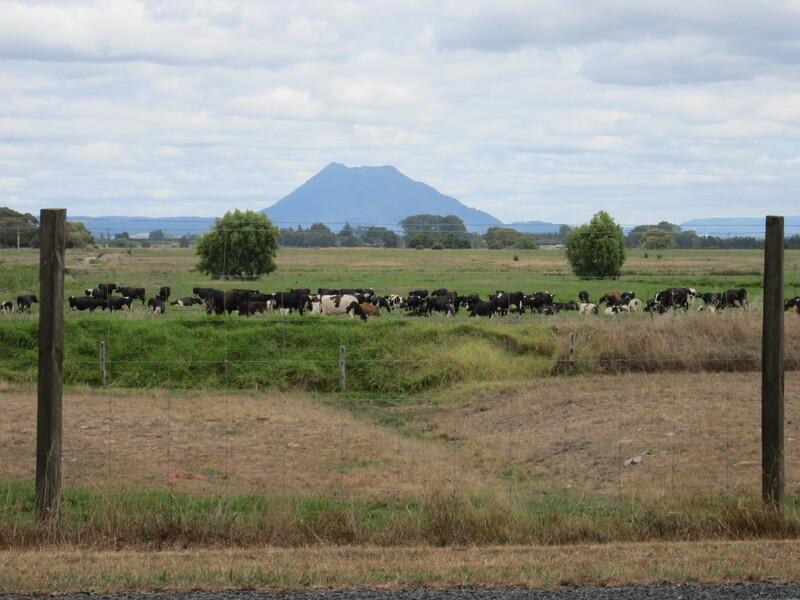 The scenary was nice with glimpses of the coast but mostly farmland and more cows. There were a few good hills along the way as well. When I got into Tauranga I met a photographer for the BOP Times who took a few photos to go along with the phone interview I did the other day. 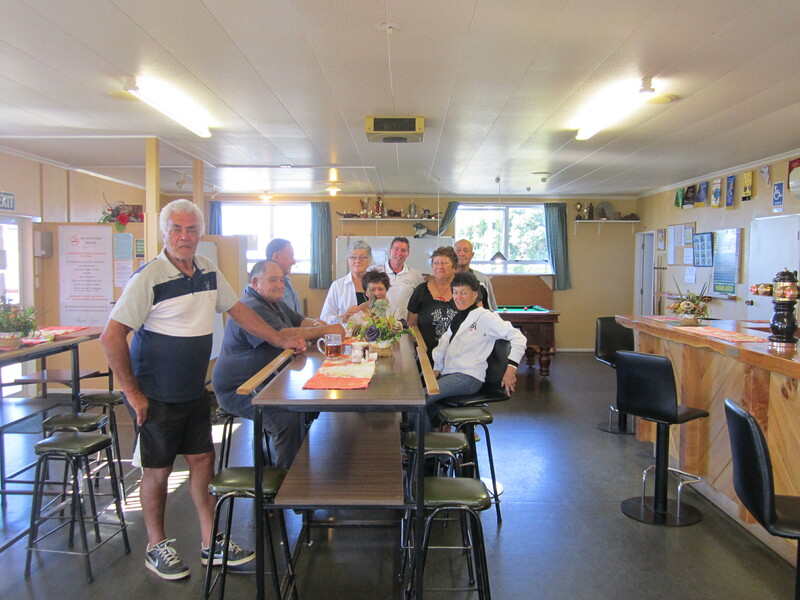 I then cycled out of the city to stay with some family friends, Peter and Margaret Bull who I haven’t seen for years……..I caught up with two of their children who I hadn’t seen or played with for over 30 years………..how time flies. As usual, I was very well looked after. Shame I couldn’t have stayed longer. Even though I am taking my time to get back to Wellington. It still feels rushed as I am realizing that there is lots to see and do along the way. 8:30 a.m. starts are just the norm now………..no matter how hard I try to get away early. 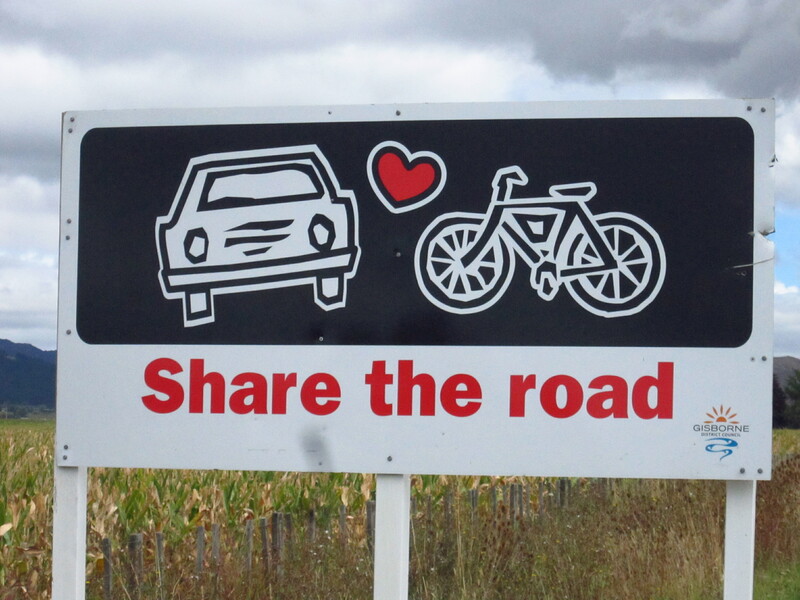 I was in the thick of peak hour traffic as I cycled out of Tauranga on state highway 29 and then 2. Traffic was terrible. I had a good fright when I was passed by a large truck on a bridge. There wasn’t much of a separation between us though I wasn’t that phased once it had passed. I just sat up straight stopped pedalling relaxed and then quite composedly continued. 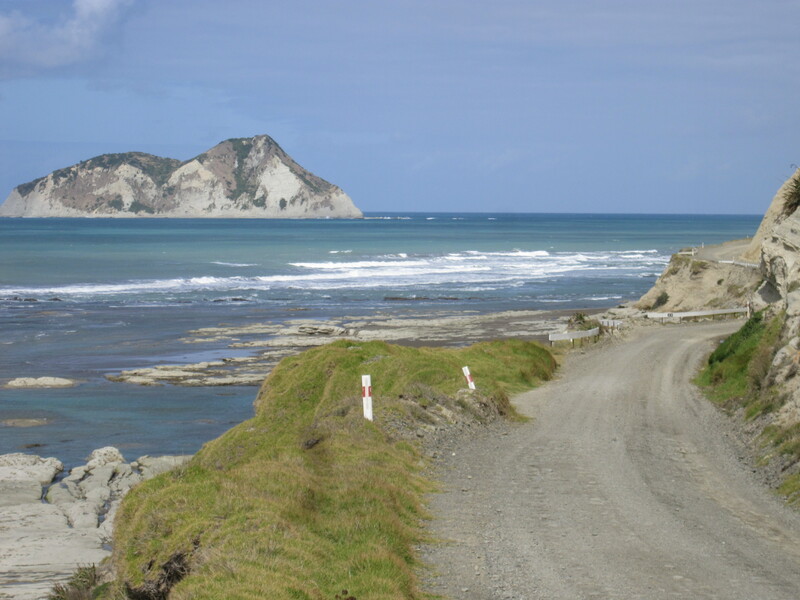 Once the road split in two and I left state highway two for 30 it was a lot quieter and very pleasant with the ocean in sight……..watching some big waves and on the other side, sandstone cliffs ran down to the road. 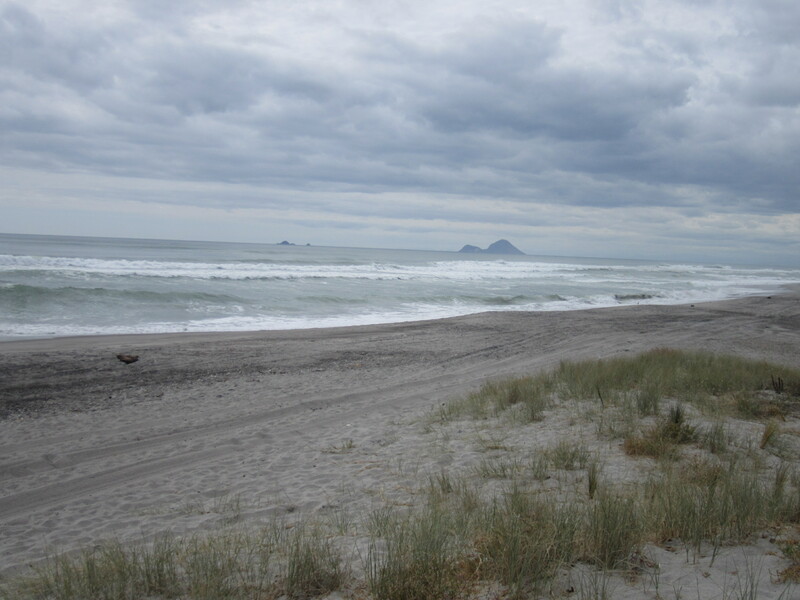 When I got to Whakatane I caught up with a local journalist for a quick interview and that went well. I should be in the local paper sometime next week. I used Warm Showers again and I went and stayed with some fellow cyclists Jenny and Graeme for the night. Very well looked after again………..and no need to get the tent out which was nice. Talk about starting late. 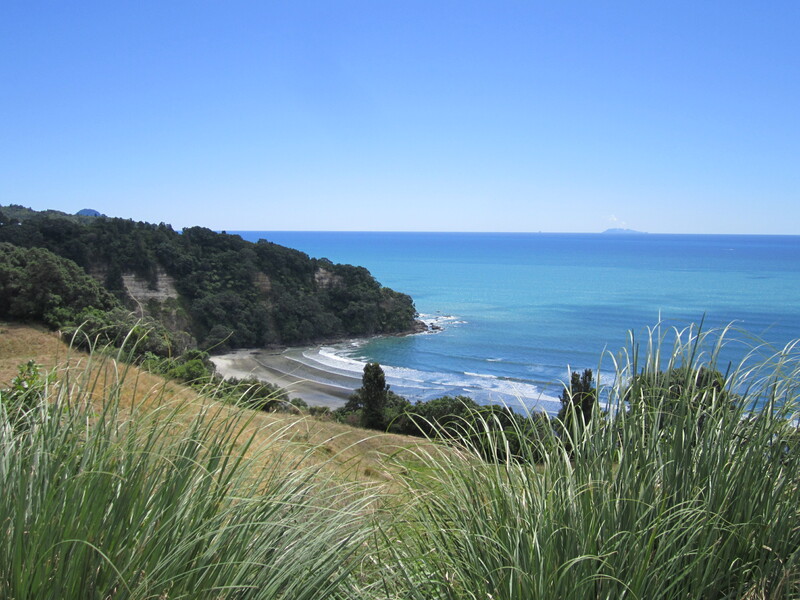 I headed out early afternoon and had a steep hill to climb straight away to get out of Whakatane. From the top was a nice view of the coast and of White Island, New Zealand’s most active volcano. There were a few puffs of steam. 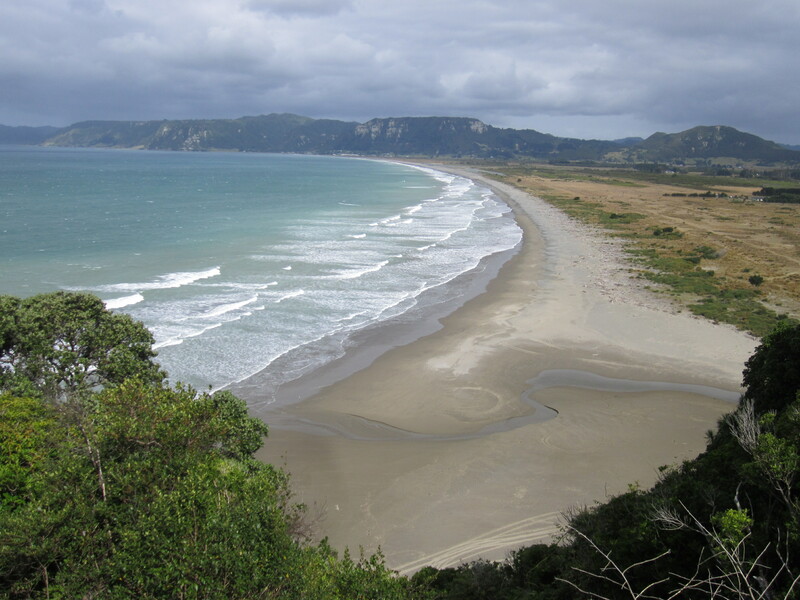 I then cycled down to Ohope beach, – nice little beach town. 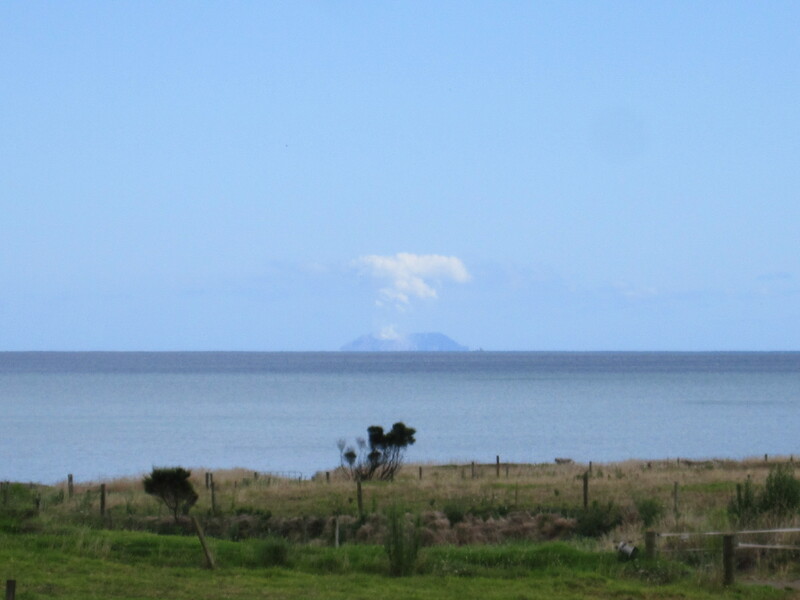 It was then around a few inlets and over a few hills till I got to Opotiki where White Island reappeared – it was looking magnificant spurting out lots of steam into a beautiful clear blue backdrop. I was going to stay in Opotiki but I ended up cycling on. I was also going to camp for free but I ended up staying in a motor camp. There I met some cycling enthusiasts all in their 60’s or close to it and I spent a very nice evening with them and I got to save my peanut butter sandwiches for another day. 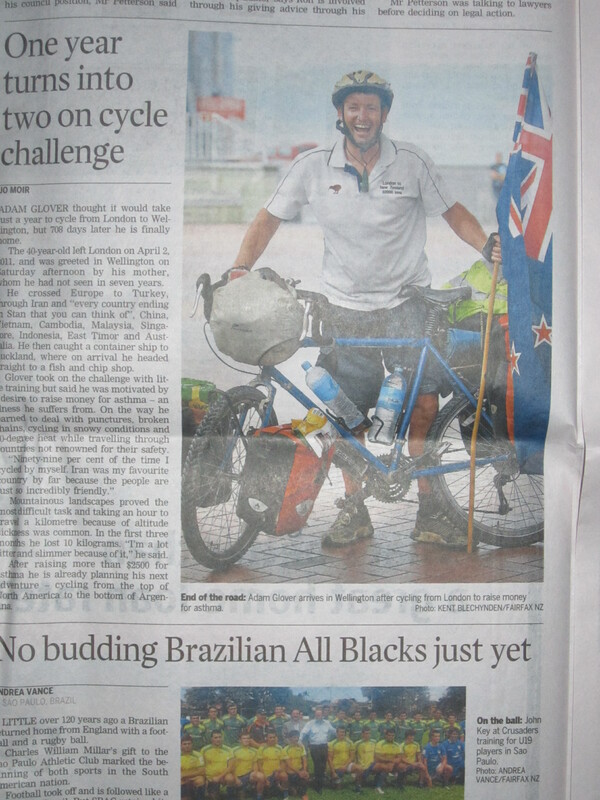 Soon after getting up this morning I was shown a copy of yesterday’s Bay of Plenty Times. Excitingly there was the interview I had recently done………….Perhaps that is why I got a few more friendly toots while I was on the road yesterday. Again another lateish start……….figured I had only 60 – 80 km to cycle. But this is not good thinking because it still took me all day to get to where I was going. There is a pattern emerging – you climb, you then descend into a bay and then after crossing the bay you then climb out only to descend into the next bay. Most of the day I still had my eye on White Island which is continuing to let off steam. 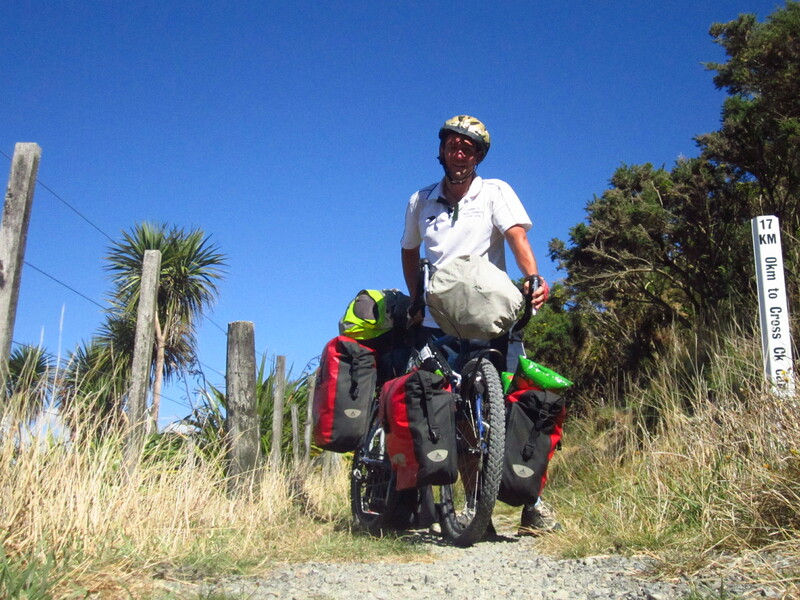 After 65 km I reached Te Kaha. I called into the RSA………..looking for some food. They kindly gave me some of their boil up. 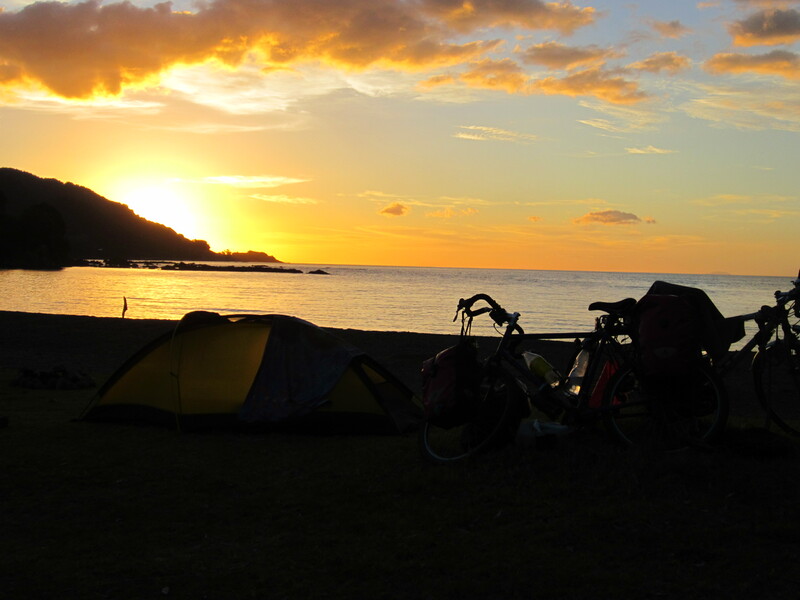 I rested there for a few hours before moving on another 20 km to Maraehako Bay. 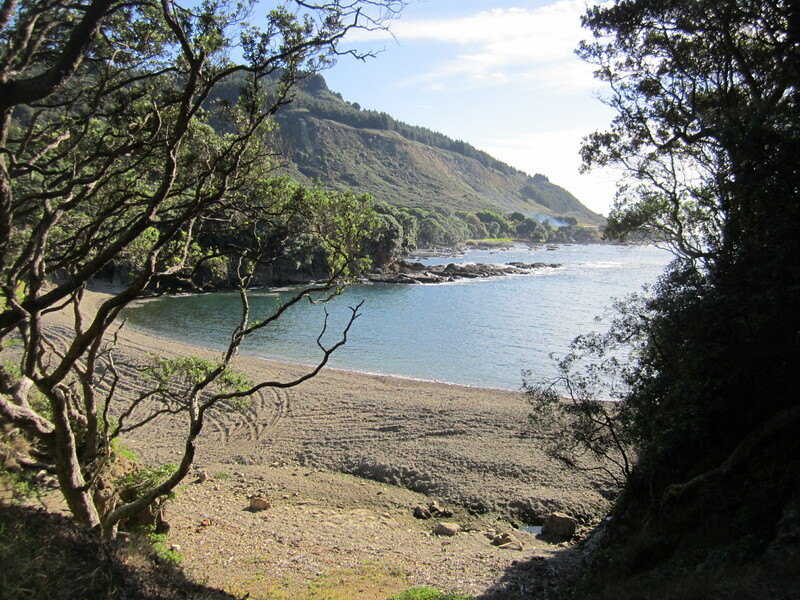 It is a beautiful bay with the campsite right on the beach. Lovely sunset. I met another cyclist here Bridget from Austria and we shared some stories. This morning when I awoke I could smell traces of sulphur in the air that had drifted in from the volcano overnight. Again I left late. The wheels on the bike not moving before 9 a.m. Straight away it was a big uphill. The roads were pretty quiet today. There is not much of anything around. 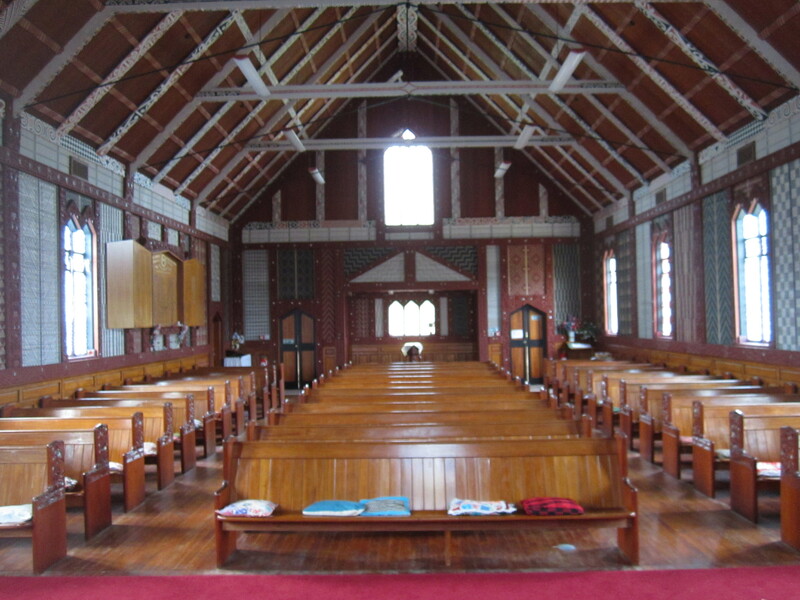 Passed a few old farmhouses……..now past saving and a few churches. I stopped in one church still in use. A note on the door read « the fishy smell next to the alter is due to the penguins nesting under the church ». I also came across a few churches now left in ruins. Around 3 p.m. I arrived in Hicks Bay. It was very windy. I cycled out to the Northern End to visit the old wharf which used to be used to load the boats with meat brought down to the wharf by train a short way away from the freezing works. The ruins of the freezing works are still visible as well. 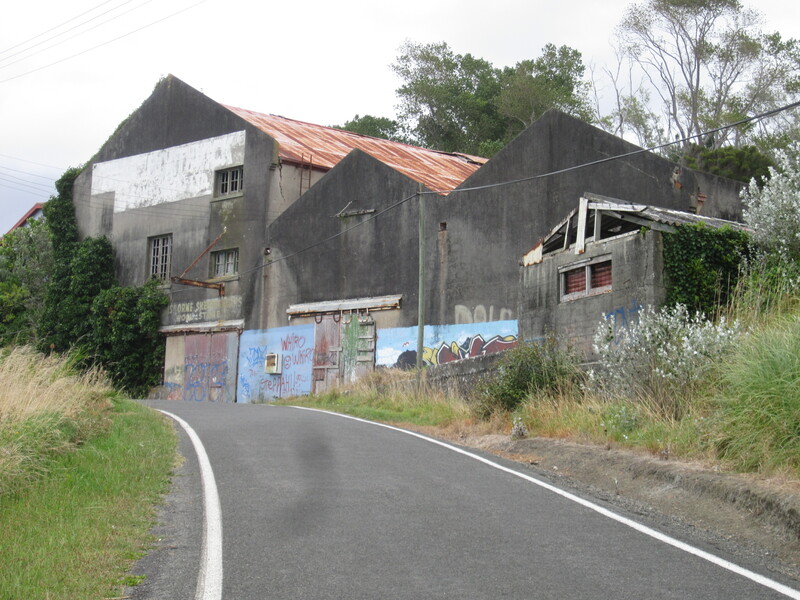 Early in the day I passed another old dairy factory. They seem to be scattered all the way around the coast. 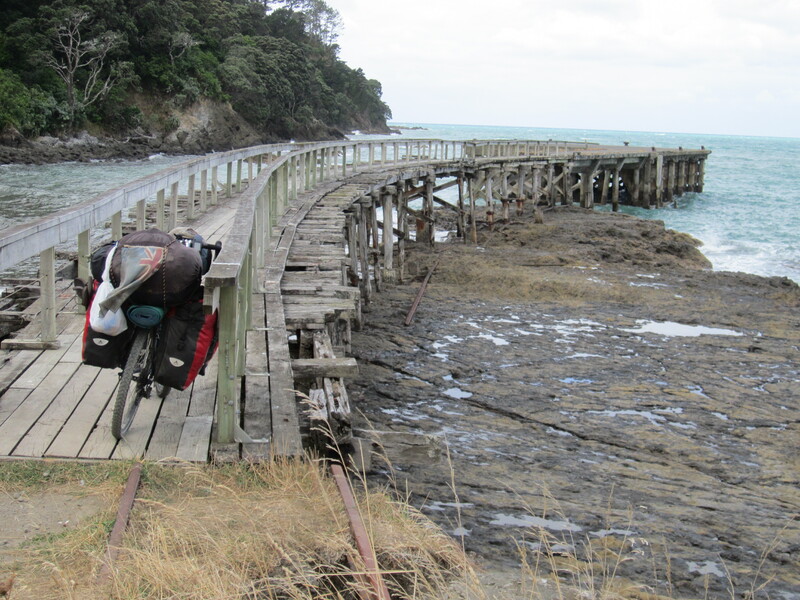 The Hicks Bay Wharf is in a bad state and the sign read « Enter at your own risk ». 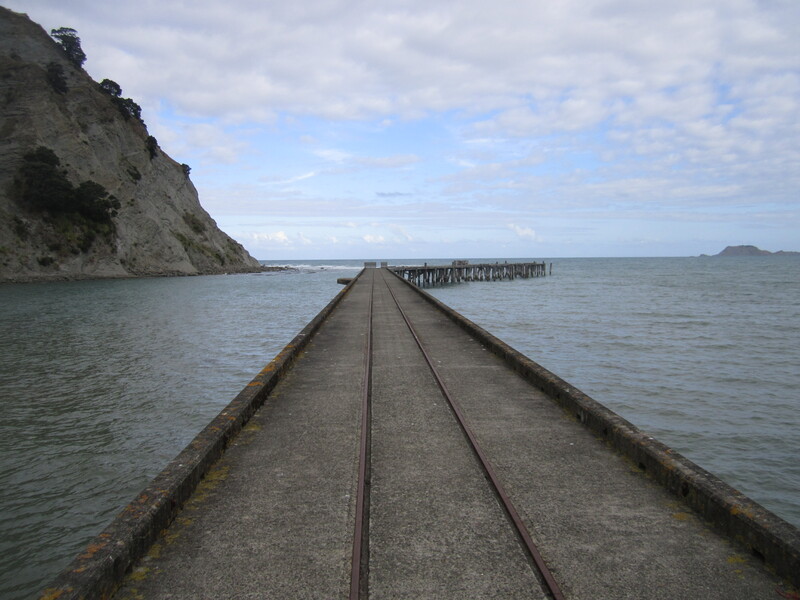 The railway line still ran out onto the wharf. 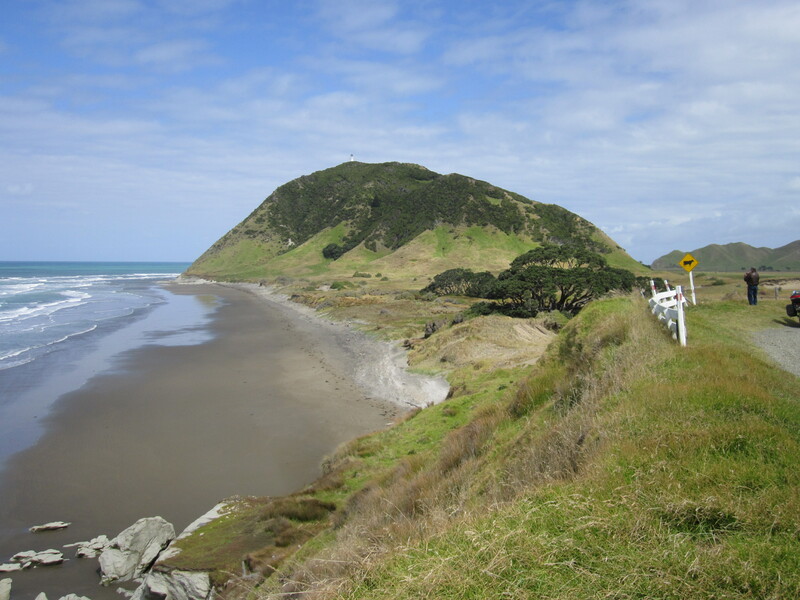 Te Araroa is the next bay over and to get there I had to climb the steepest hill of the day. The wind was super strong. At one point the bike nearly came to a complete stop. I was hungry when I arrived in Te Araroa. Only two shops – one was selling toasted sandwiches. I asked for one……….which are normally $2.50 and came away with 2 for $2. I ate them before I proceeded to cycle out to the Backpackers. It turned out to be a little gem. It used to be a convent and inside everything dates back 60 years. Nice wooden floors and high fancy ceilings. I camped on the lawn out front beside some old fountains. 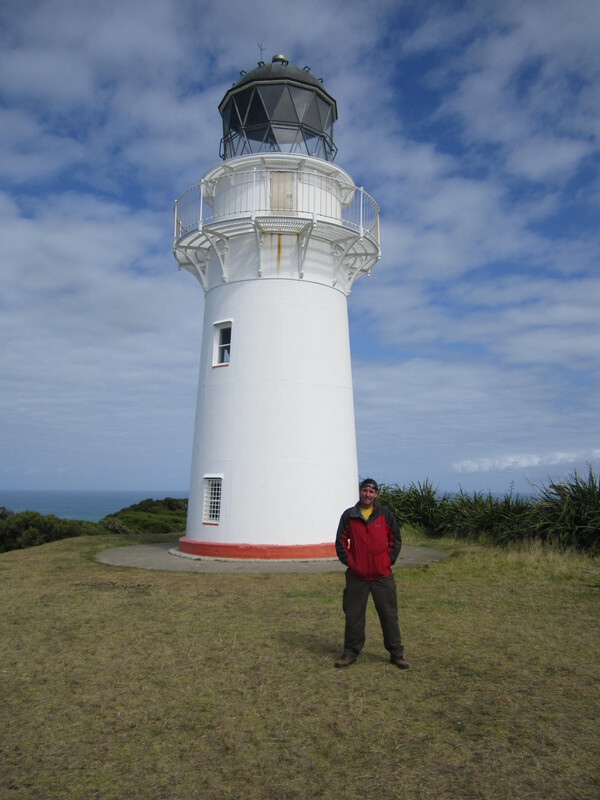 I will stay here two nights and try to hitchhike the 20 km down to the East Cape lighthouse tomorrow. It was a good day to stay off the bike. We had some rain in the night and it continued on and off all morning. Coming this far I thought I’d better go out to the East Cape lighthouse. 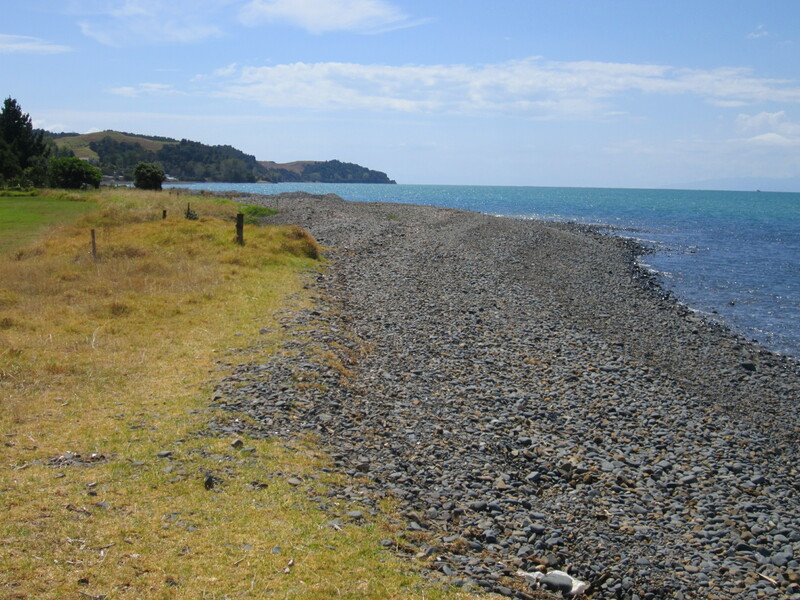 The most Eastern part of mainland New Zealand. So after lunch I walked back into town and started to walk some of the 20 km out to the lighthouse. In the banks above the road you could see buried shells . Once laying at the bottom of the ocean probably millions of years ago. I wasn’t planning to walk the whole way so luckily after a few km a tourist came along, Karl from Switzerland, who kindly stopped and gave me a lift there and back. Just as well because in that whole time we didn’t see another single tourist. From the end of the road there are 700 steps up to the light house. Nice view to be had at the end of it. 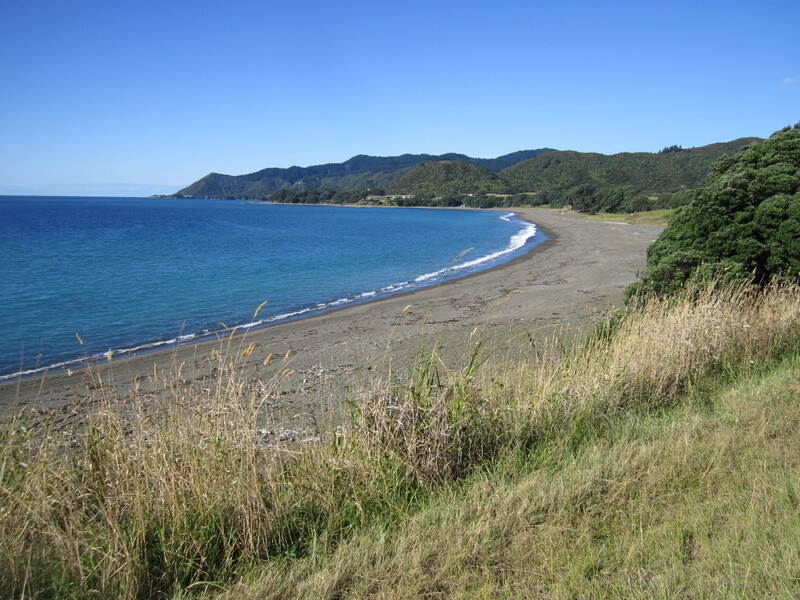 Talk of some big hills between here and Tokomaru Bay. Nearly had me tempted into staying another day. But in the end I bit the bullet and headed out and straight into the hills. At least I got the worst of the hill out of the way early. It was very windy and steep passing through a mixture of forests and farmland and crossing a number of wide rivers before heading up through wide open valleys. It was a much cooler day today, very cloudy with patches of light rain. You always knew when you were getting close to the peek of the hill because you would feel the strong headwind coming over the top. 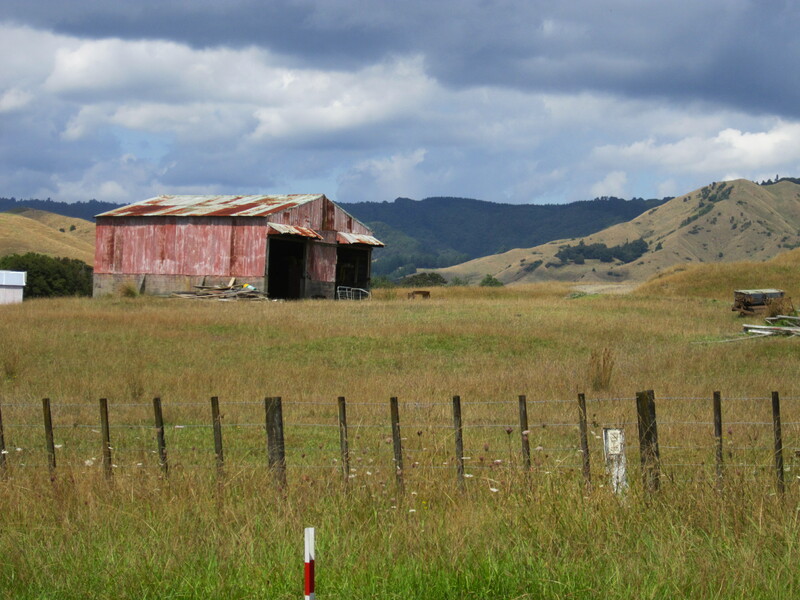 Ruined farm buildings are scattered along the road. I stopped for a late lunch around 3 p.m. and joined a couple also at the rest area for a nice hot cup of tea, some cake and a tomato sandwich. 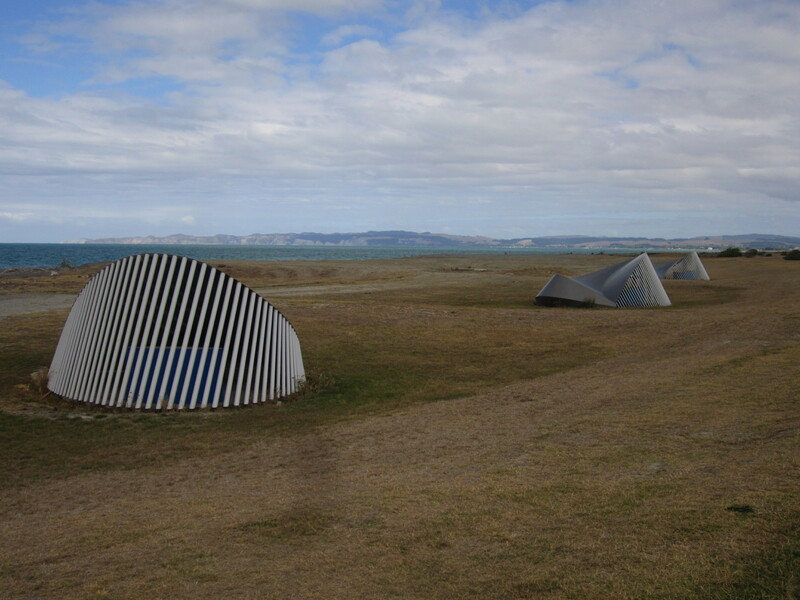 It was only another 16 km down to Tokomaru Bay and its deep-sea wharf. It was like going back 50 years. It was once a very busy little town. It had a freezing works and wool storage. Now there is very little with all the shops and banks in the main street closed and boarded up. Its a lovely bay with its unspolit and very natural looking beach. I cycled along to the northern end of the bay to visit firstly the old red-brick wool storage buildings and then the ruins of the old freezing works which had been abandoned in 1953 and were now overgrown. Strangely a few houses have been built among parts of the ruins of the freezing works. I wonder if these houses ever had planning permission. Getting down to the old wharf – the first part of the structure is concrete and is long and straight. The rest is timber and lays in ruins. You had to tread carefully and at your own risk. It was then time to find some accommodation. I went up to the backpackers and asked to camp. $18 a night so I left it. I have a benchmark of $15 and won’t pay more. I was told the camp ground was $10 but no cooking facilities. So I stopped at the burger van for a double cheese burger and chips for $9………….Was starving by this point. Then some bad news. Burgers cancelled because no more hamburger buns left; as the lady tried to refund my money, I told her to keep the money and I gave her a loaf of bread that I had and told her to make some hamburgers out of that. Thankfully she agreed and still gave me $4 back………….so in the end I got dinner and a camp site for $15. What happens when you leave a bay………..yip you cycle up and up before descending down to the next bay and that was the case this morning. There were 4 very steep km followed by a nice 15km down run followed by a bit of a rolling finish down into Tolaga Bay. All in all the cycling day was done by 1 p.m. This left some time for an afternoon hike after I had checked into the motor camp 3 km out of town but conveniently located next to the Old Tolaga Bay Wharf and the start of the 5 km Cooks Cove walk. 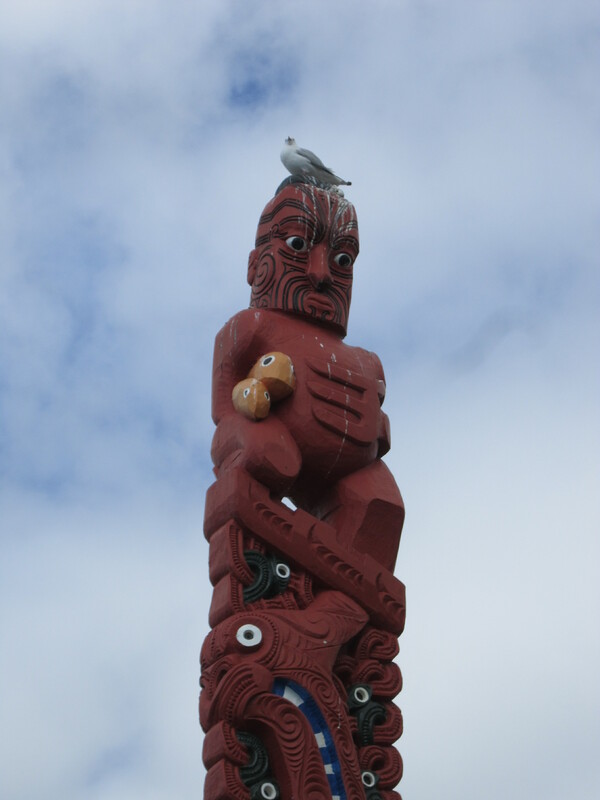 It was across farmland with roaming sheep and cows and took you up beside the very high cliffs that overlook Tolaga Bay beach and the Wharf. You then dropped down the other side walking through lovely native bush with birds singing until you came out into a clearing at the bottom, which led to Cooks Cove. Named after Captain Cook’s visit in 1769. Close by was the hole in the rock that went through the hill back into Tolaga Bay. Lucky the tide was out and walking through you could then see the old Wharf. It is over 600 metres long and in its hayday was used to load meat and wool. It was a commercial wharf up until 1968 before it closed. It then fell into disrepair like the many others on the coast. Just recently it has been restored as it is seen as an important tourist attraction………..that will generate some income for the floundering local economy. It rained most of the night and was still raining when I got up. I packed everything up relocated to the camp kitchen. There I made myself comfortable while I waited for the rain to ease. I ended up waiting till 11 a.m. and I then headed out into a light drizzle and a good climb out of the bay and out of the rain. State Highway stayed high and away from the coast for a good 35 km before returning to the coast. Was a good place to stop for a late lunch. I was lucky to run into a couple I had met on the way to Tokomaruo Bay and I had lunch with them. I used Warm Showers again tonight calling in on my hosts Anne and John. They kindly gave me a bed in their sleep-out in their lovely back garden. The property behind Anne and John was a house and garden a few years ago. So before I left we went for a bit of a walk along the many board walks that criss-crossed the side of the hill till we got up to the lovely little pond. 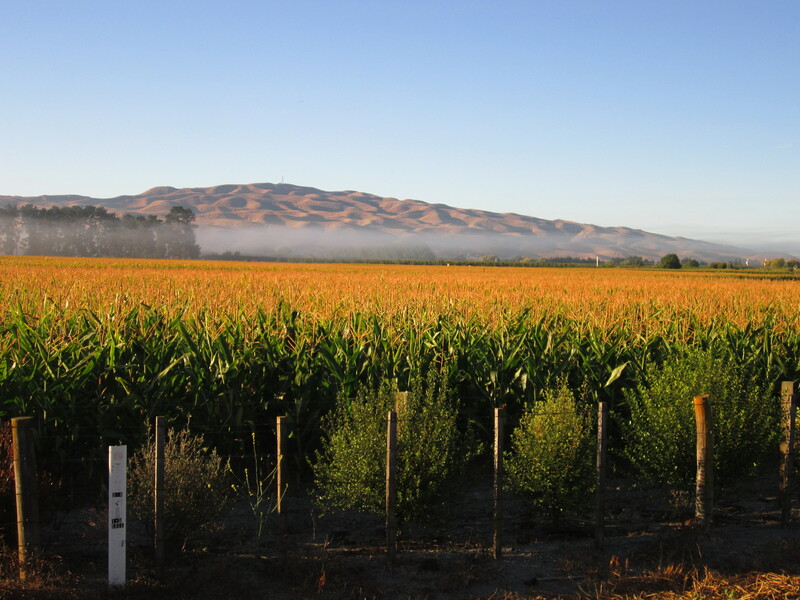 It was 9 a.m. when I got away and I cycled the 7 km into Gisborne city and after a little look through the town I stocked up in the supermarket and had a quick session on the Wifi at McDonalds. 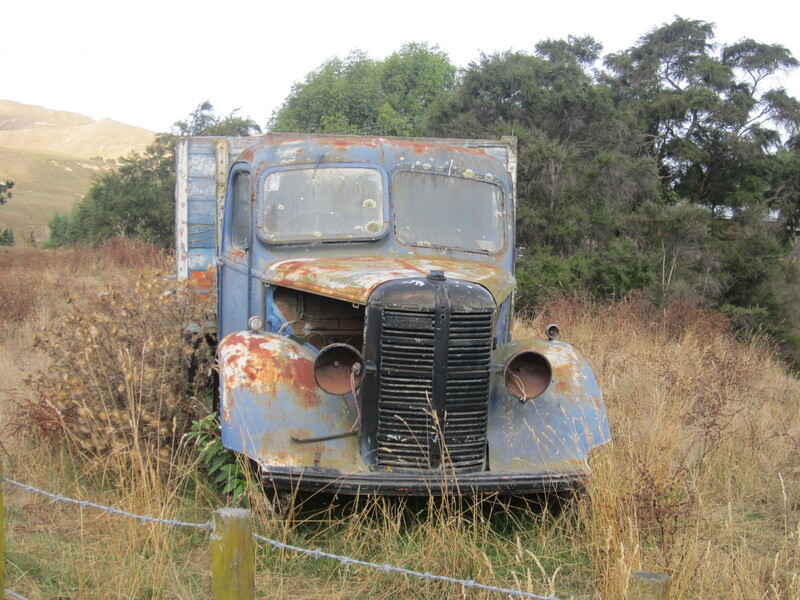 I finally left Gisborne at 11 a.m…….which was a bit too late really to get to Napier o via Wairoa. 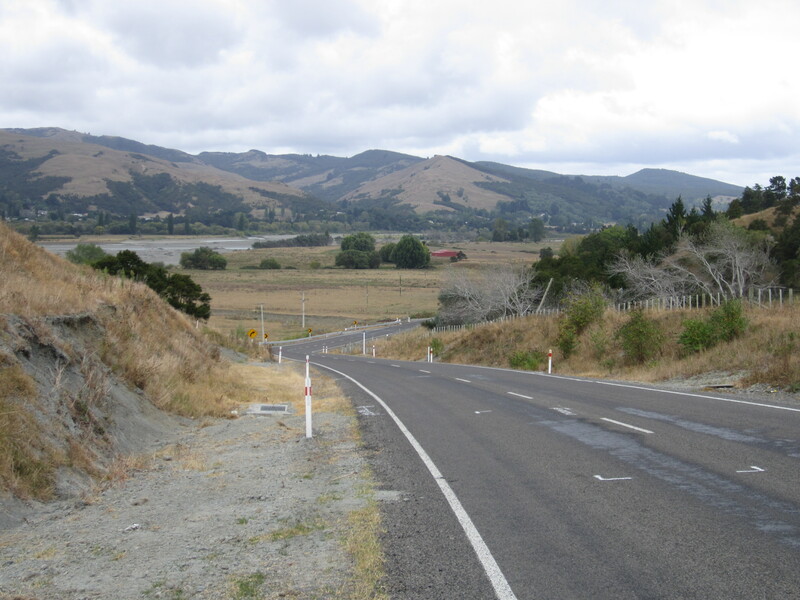 To get to Wairoa I left the main road and went by a road known as the Gentle Annie………..she started off pretty flat…….as always there were hills to come and some steep ones too. The top of the Gentle Annie was 360 metres above sea-level. It was a very scenic road turning and twisting through the valley while following the river. 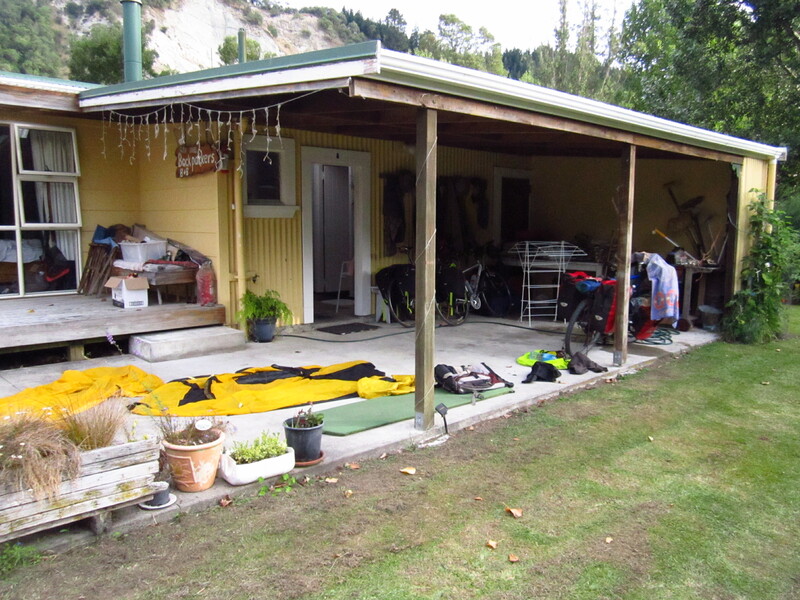 I came across a backpacker farm stay which sounded good…….thought it would be too expensive and cycled on. I then met on the road the owner Ross who said he would give me a bed for $10 and said there were some other cyclists staying as well. My arm was easily twisted and I headed back a few km. 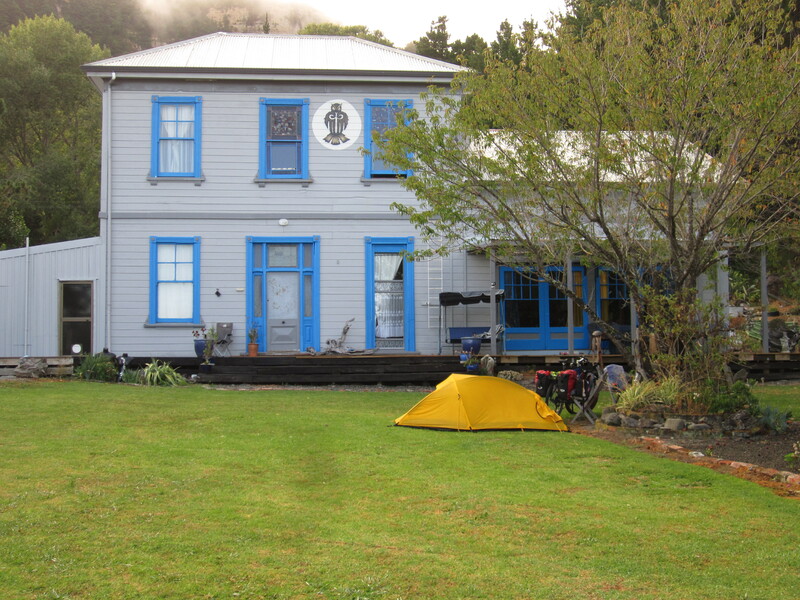 The hostel is in the old shearing quarters and a little away from the main house. Two bedrooms and a nice lounge and kitchen. Nice little pad to stop for the night. The two other cyclists were Tatiania and Matthieu from Belgium who are cycling and working in New Zealand for the next year. The farm buildings are close to the river and on the flat. Behind the main part of the farm it is all extremely hilly. Tatiania and I went for a long walk over the farm. Mostly sheep and a few cows. We hiked right up to the highest point at 650 metres. From here we had awesome views over the farm. However, coming down proved difficult. Being so steep we had to stay on the fence line and that just took us away further and further from the house. It was starting to get dark as well. We eventually found a trail heading the right way and it got us back not too long after dark. I joined Matthieu and Tatiania for dinner and we had a really enjoyable evening. This is their second night on the farm and they will stay another night tomorrow as Matthieu needs to finish some work on the computer. 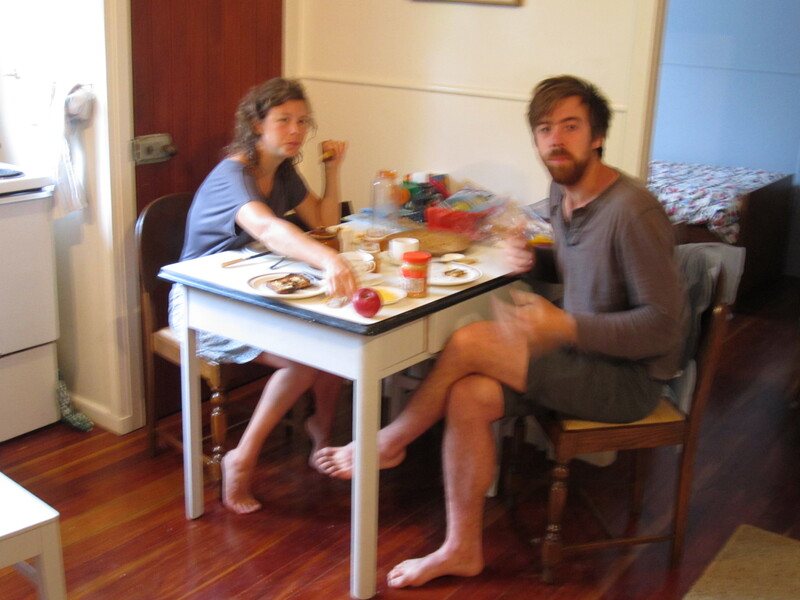 I got up at 7 a.m. for some breakfast and Matthieu and Tatiania joined me shortly after. We chatted till about 9.30 a.m. and I became less and less keen to cycle as I was enjoying the relaxed atmosphere. 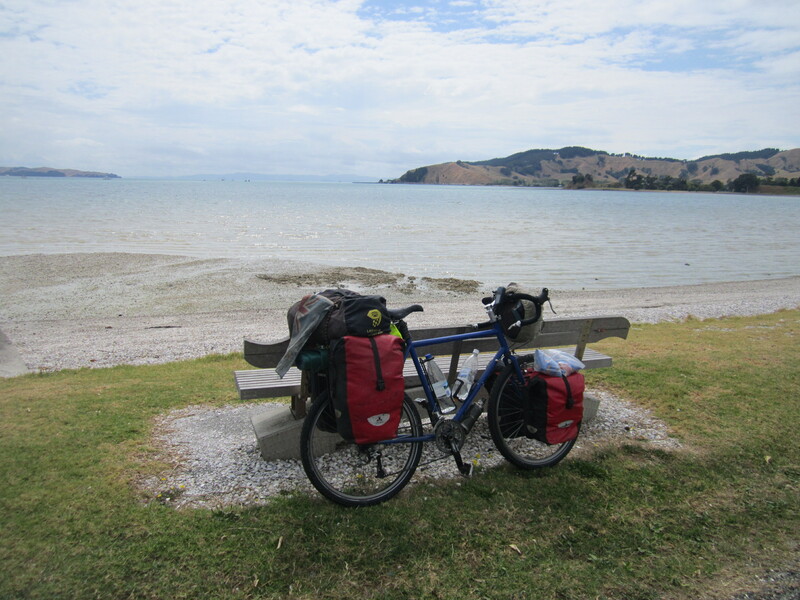 I soon decided I would be staying another day as well though this is going to make things a lot tougher cycling to Wellington from here onwards. I will have to make up for it with some long days. 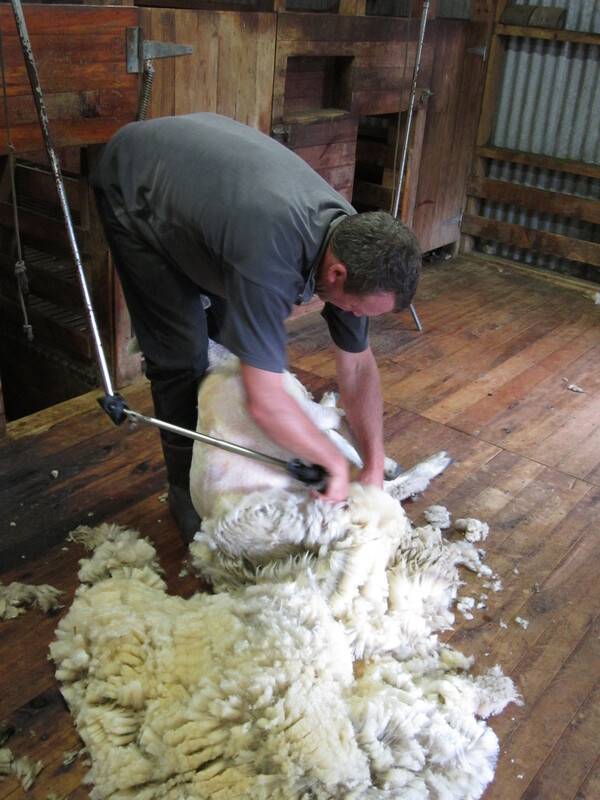 Mid-morning, Ross came over and invited us to come over to the shearing shed to watch some sheep get a haircut. 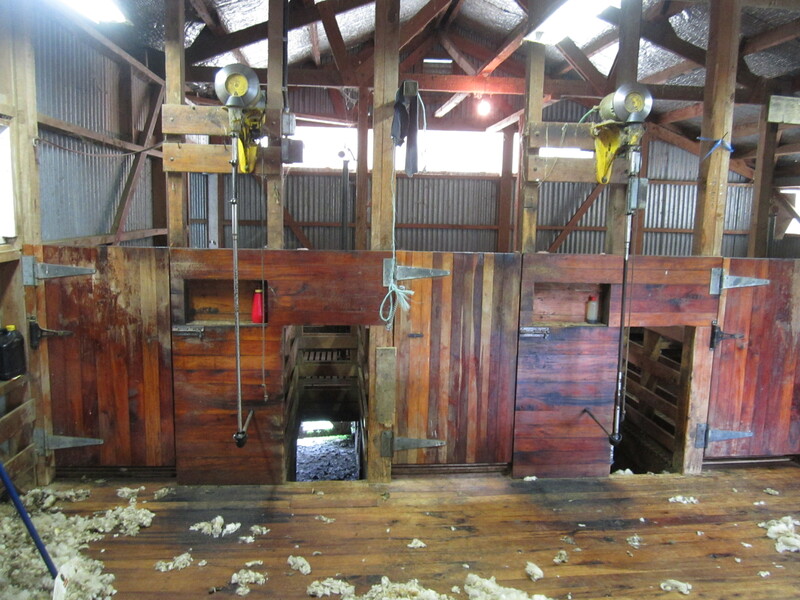 There are 1800 sheep getting shorn twice a year. By staying an extra night on the farm I have put myself under a bit of pressure to catch up so I can get home to Wellington on time. I made sure I left a lot earlier than I had been doing. It still took me most of the morning to reach Wairoa just 57 km away. The road was very scenic. 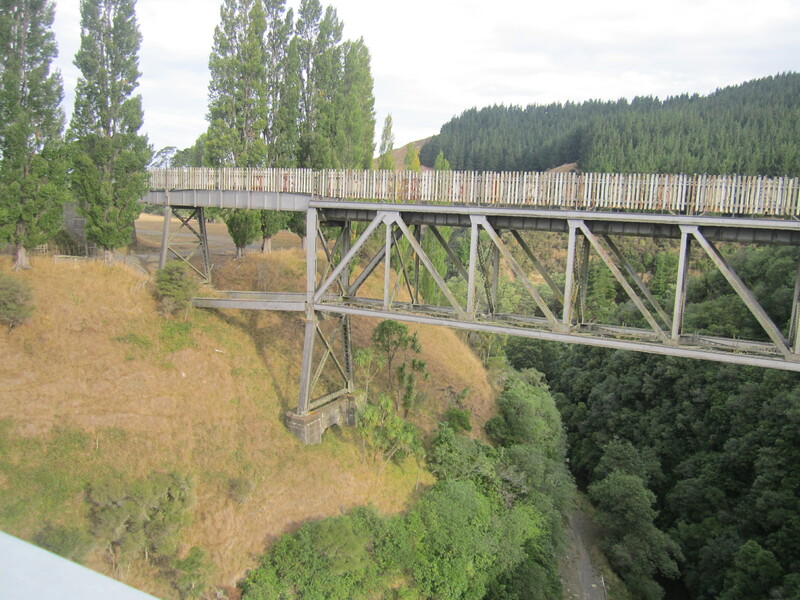 At one point we crossed over a 250 metre high viaduct it was also very hilly. Another plus was the lack of traffic. It was a pretty tough day. In the afternoon there were a whole lot more hills with a lot of climbing. Being back on the main road traffic became a lot heavier and room for cyclists a lot less as the hard shoulder disappeared. I reached the Doc Camp site next to Lake Tutari late in the day. 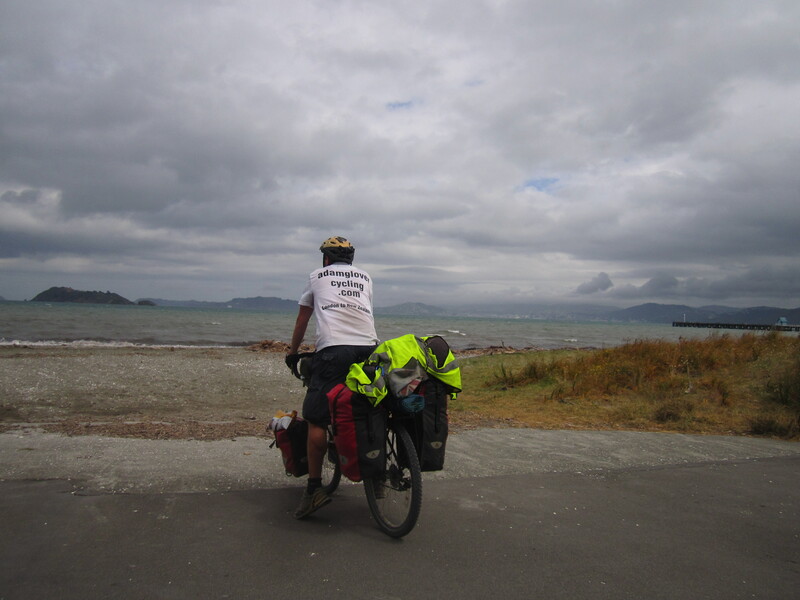 I was pretty stuffed by then……………but pleased with the 135 km which has gone along way to getting me to Wellington. 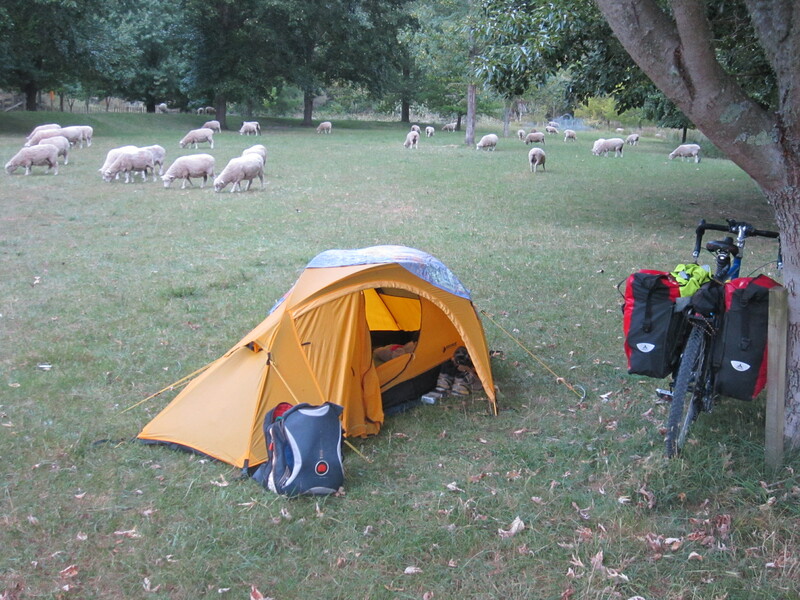 I camped in a field full of sheep. The lake was nice with many different birds making it their home. Soon after the sun set, the rain arrived and it lasted most of the night. It was still raining in the morning when I got up. I couldn’t waste too much time and I had to head out into it and straight into a long slow climb up one side of the valley before crossing over and heading back up the other side. I ended up pretty wet and cold. But what goes up must come down. So I had a nice run down to the coast followed by a nice 20 km cycle along the coast into Napier. I came through the old port of Arhurai, now redevelopped and full of bars and restaurants. I cycled some of the back streets which I haven’t seen for at least 15 years. Passing by my grand-parents old house which I used to stay in during the holidays whilst I was growing up. 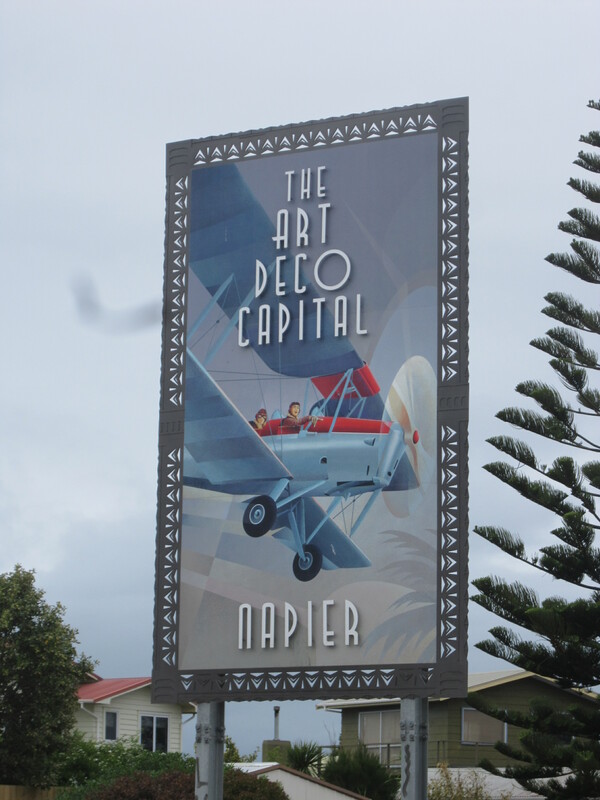 I spent the afternoon in Napier before heading south along the coast towards Havelock North. Just 26 km away. Leaving the coast it was nice riding through the country roads passing all the many different fruit orchards. I used WarmShowers again and in Havelock was kindly hosted by Allan and Valerie who had a lovely old house now very modernised but with all the character. We had a lovely evening. and I was spoilt again with a lovely meal with wine to go with it. Valerie and Allan were very helpful in helping me plan my route onwards in order to avoid the main roads for a little while. It was a cold but sunny morning. I cycled the back roads out of Havelock. There was a low mist hanging over the orchards. I reached Te Autu in time for morning tea and stopped for a coffee in a cafe that used to be the old Sunday School. 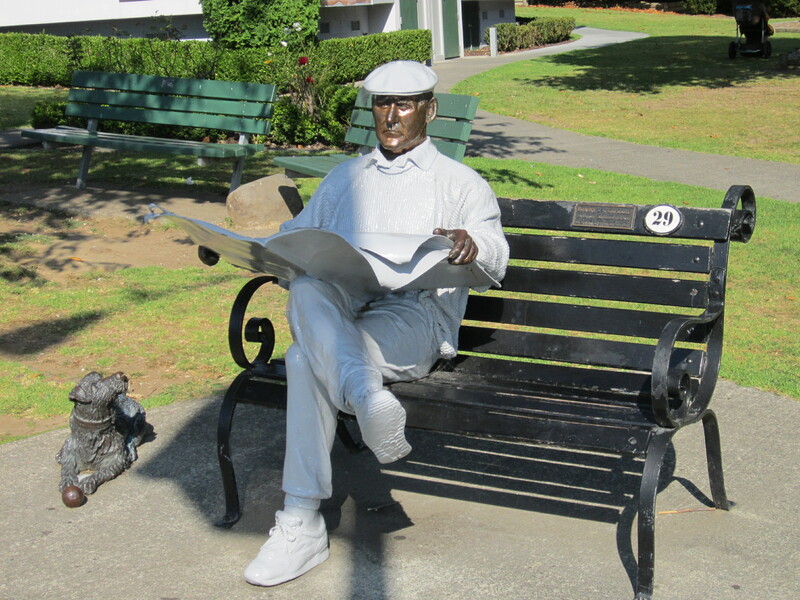 I stopped here for a good hour reading the paper and talking to locals. It had started to heat up by now. I pushed on to another country town for lunch, Waipukurau. After lunch it was tough going. The road was pretty flat. But cycling along the plains into a very strong head wind was soul breaking. It took me the rest of the afternoon and did not get very far. I got to Norswood around 4:30 p.m., which is a small town that was first settled by early Scandanavian settlers. Danish and Norwegian flags are doted around the town. 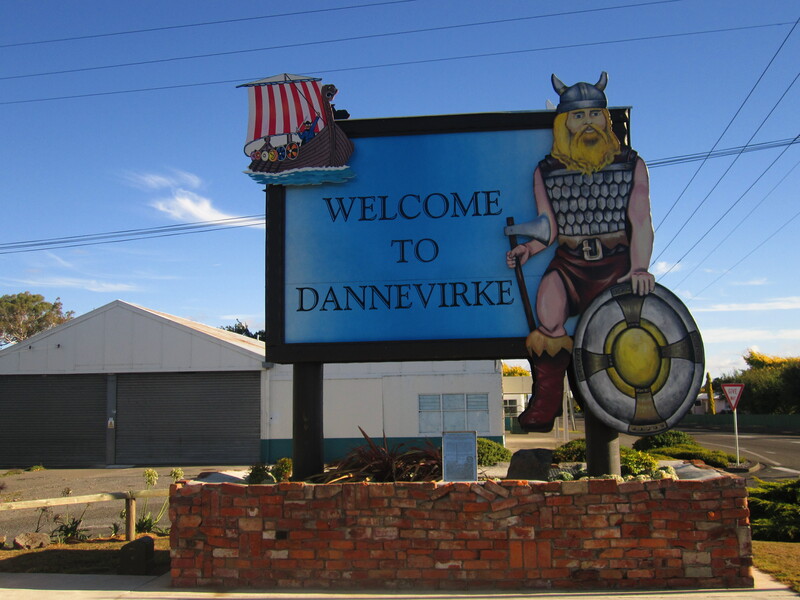 I pushed on again at 5 p.m. for another 20 km to Dannevirke and this left me now only about 27 km behind schedule. I camped in the campground which was a bit of a wildlife park full of wandering birds. I had some cheeky vistors. I started the morning with a 27 km cycle down to Woodville. I cycled straight through. 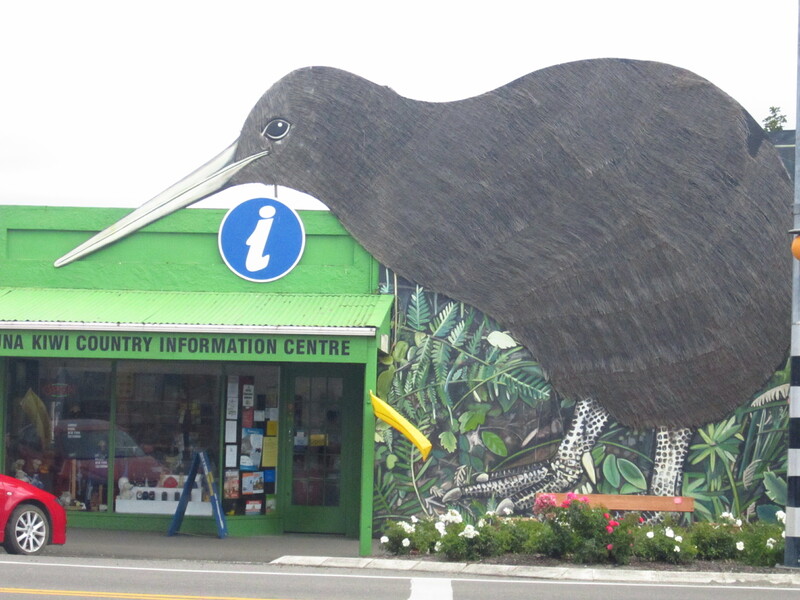 promoting the nearby Mount Bruce wildlife centre famous for its Kiwis. I got into Masterton and again I used Warm Showers. I was kindly hosted by George who cooked up a nice piece of steak for dinner. Well only one more sleep and then it will be all over. I am excited that I will be home but also a little sad. I am going to miss what has become a very nice lifestyle for me over the past two years. I allowed for today to be a easy day not as to put too much pressure on me. I started by taking the opportunity to Skype some family and friends overseas. It had been a while since I had a relatively good internet connection. The free ones at McDonalds and StarBucks are never that good. It was such a lovely summer day. Sun and no wind. Nice and flat roads as well. 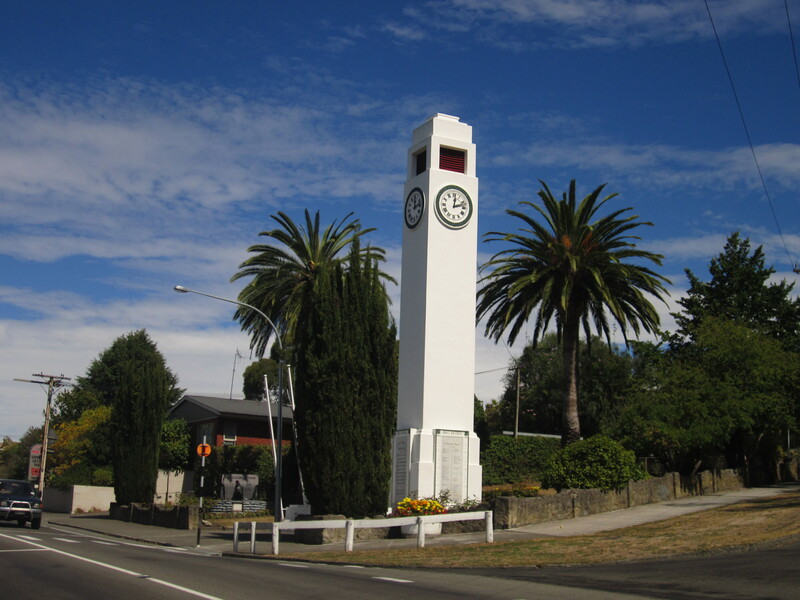 To get to Featherston it was nicely broken down by the interesting and colourful country towns of Greytown and Carterton. So before I knew it I was in Featherston for lunch. 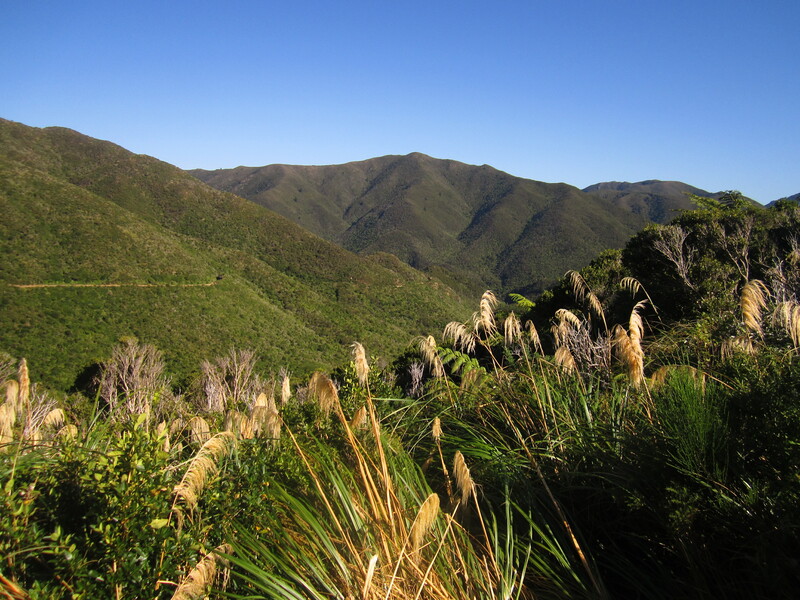 From here the plan is to take the old Rimutaka incline railway trail that goes up and over the Rimutaka range. I plan to camp on the summit. 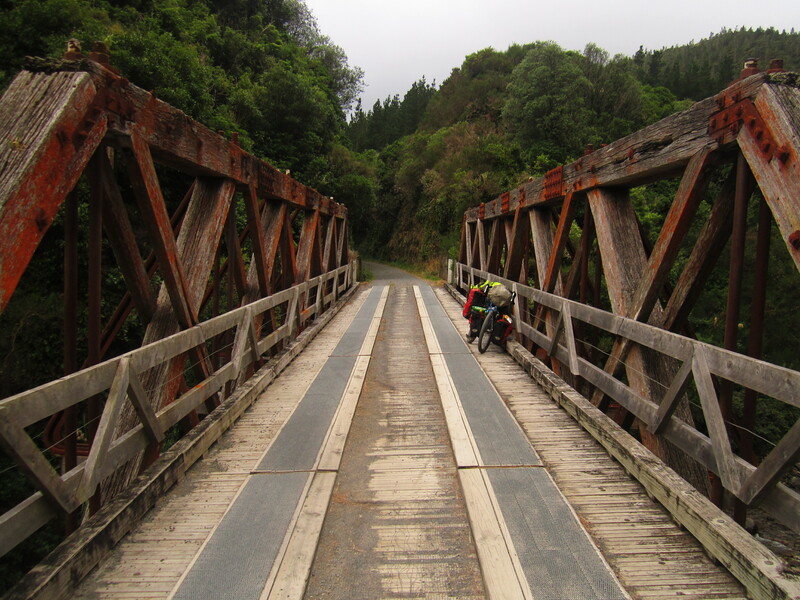 So tomorrow I will have another reasonably good ride into Wellington. 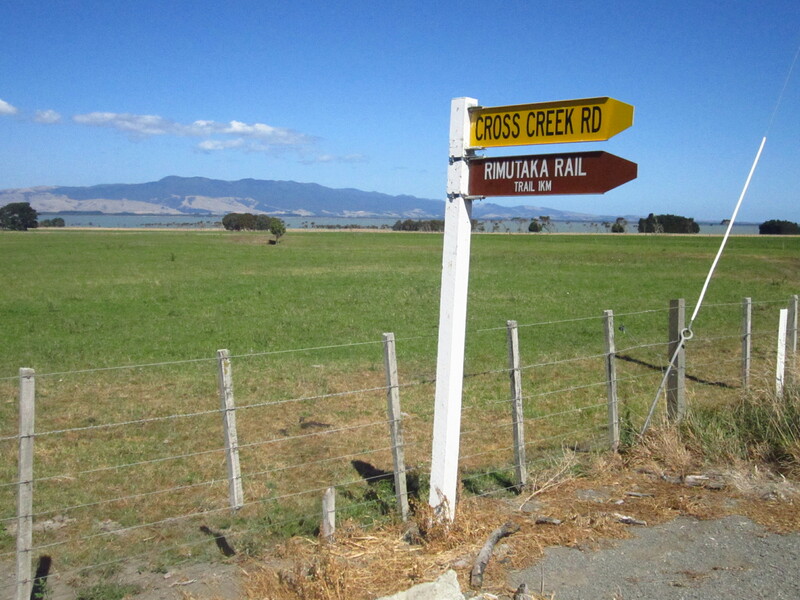 Once I left the road, I got on a very narrow and windy track that took me up to the old cross-creek station. The shunting yard was full of old foundations of old workshops, old turntables and station houses. I then started the 15:1 gradient climb up the valley surrounded by bush and warmed by the sun. On the first half of the trail were two 109 metre tunnels to cycle through and after there was a part of the trail where the embankment had been washed away. 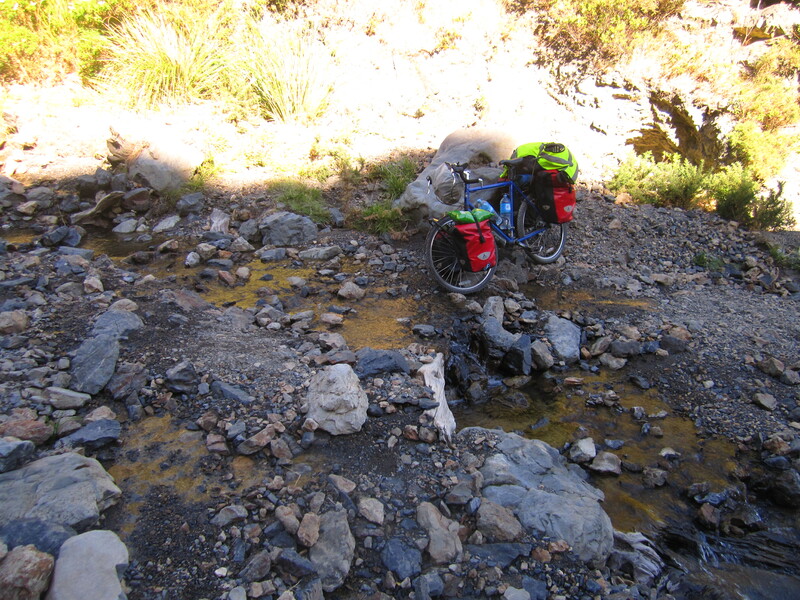 It meant you had to go down a steep track cross the stream and then push your bike back up another steep track. I could hear many goats in the valley and I’m pretty sure I had some wild pigs pass quite close to me as I was resting on the side of the trail. Just before I reached the summit there was a 565 metre tunnel. A torch was definitely needed to help you cycle through. The tunnel was freezing and a few pot-holes as well. Leaving the tunnel you arrive at the summit station which is a big open area covered in sun. It was such a nice evening. 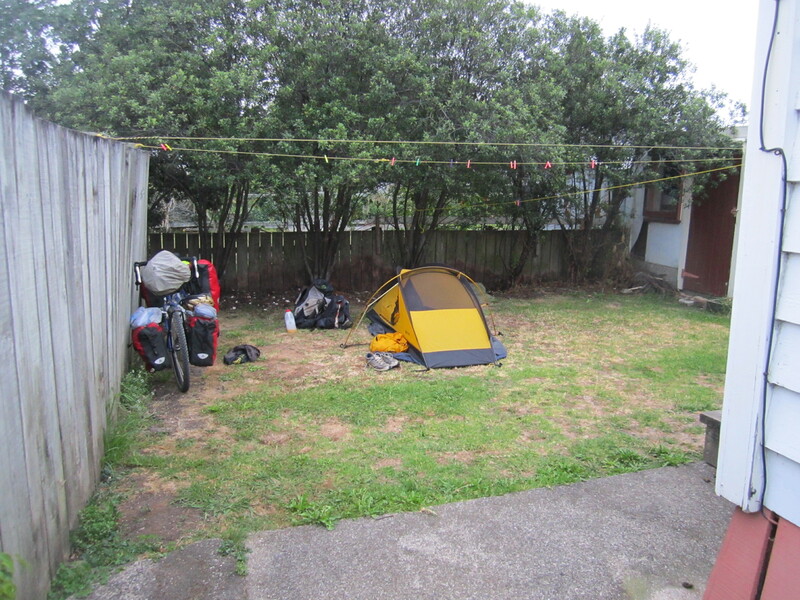 I set my tent up on the nice grassy area that was once part of the shunting yard. 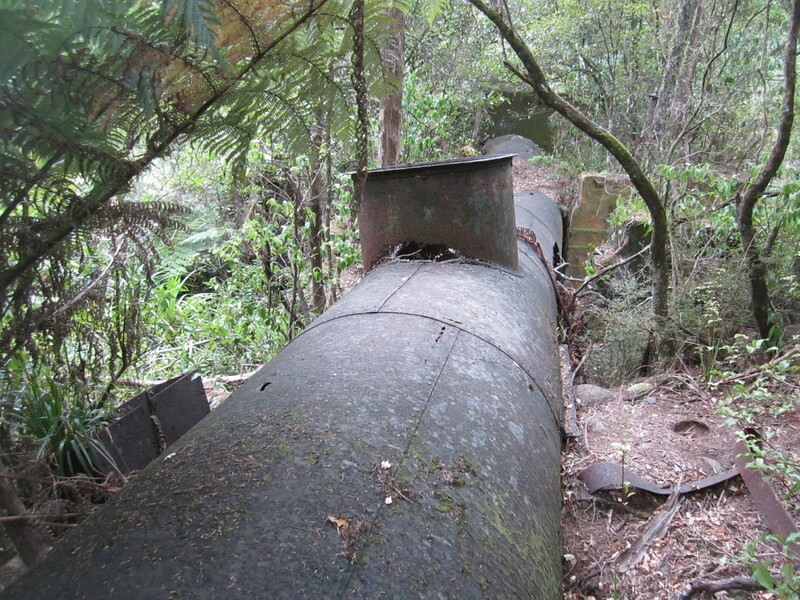 Old chimneys, brick paths, old turntables and large rusting parts of old trains reminded you of the past. 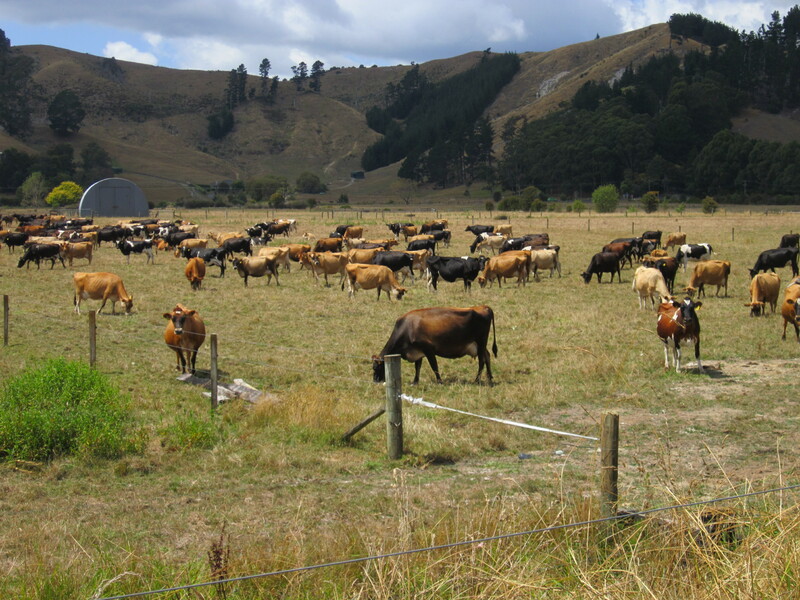 New Zealand is in a state of severe drought. 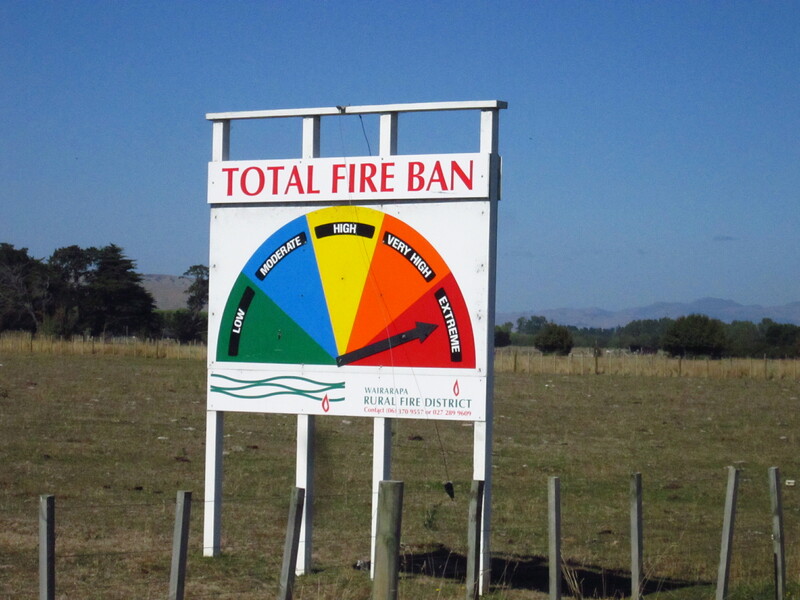 Total fire bans are in place………so even though allowed I haven’t dared use my gas cooker. Tonight I had a cold pie and sausage roll which I picked up from the bakery in Featherston and some fruit. I went to bed relatively early. The stars were amazing. The sky was completely clear of cloud and you could see them so clearly. I listened to the call of an owl that was nearby. This didn’t stop me from sleeping. I couldn’t get any phone reception but I could listen to the radio. Well this it ………..the last day of a truly wonderful two year adventure. In just a few hours it will all be over. When I emerged from my tent this morning I was surrounded by low cloud and mist. Somewhat very different from the night before. I was very relaxed. It just felt like any other cycling day. I had some breakfast, packed up the tent and then enjoyed a very nice and easy cycle down the west side of the incline. I came a little unstuck at the end with the cycle gate because I couldn’t get my bike through. So I had to unload the bike to get past. Once past the gates I was back on the main road. 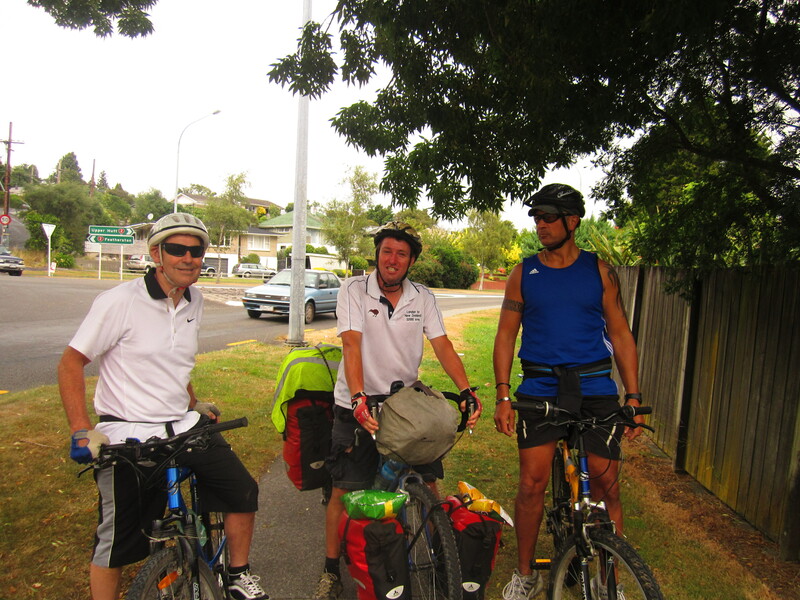 I only had to cycle a few km before meeting some old friends Peter and Laurie who had come out to cycle the last 40 km into Wellington with me. From here we went onto the cycle path along the Hutt river. Nice and flat and we were in no rush having plenty of time. So much time in fact that we stopped off at the driving range at Silver Stream for a hit. My golf is definitely worse after such a long time. Back on the bike we only cycled a few more km down the river to Lower Hutt where we stopped for coffee and a bite to eat. Everything on schedule for a 3 p.m. arrival in the city. The last bit was along the river to Petone I then got my first look at Wellington city in 7 years. We cycled along the foreshore and then onto the cycle way that went between the railway line and the motorway up into the city. Once we got into the city. we slowed up as we had a bit of time before our expected 3 p.m. arrival at Queen’s Wharf. We stopped at Iride bicycle shop. The guys there were pretty interested and kindly bought me out a cold drink. The owner Andrew came out and invited me to come back sometime next week for lunch. Refreshed it was then only a few minutes before I reached the main gates of Queen’s Wharf and as I cycled in I was greeted with the sight of banners and ballons and by the roar of the crowd as I reached the magical Finish Line. Job complete. My parents were there…………first hugs in 7 and 4 years respectively. It was then a big haze as a beer appeared and I quickly went round greeting most people I hadn’t seen for seven years. 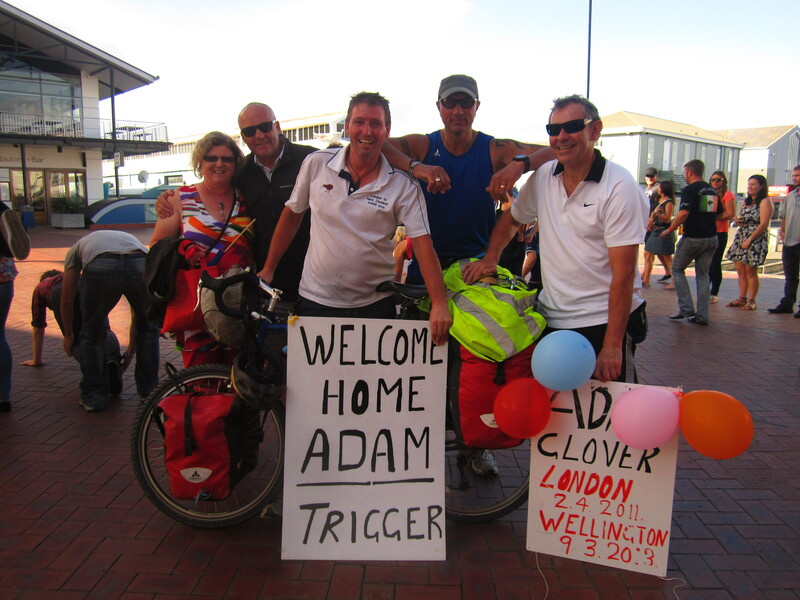 I really appreciated the effort people made to come down and welcome me home on such a special day. 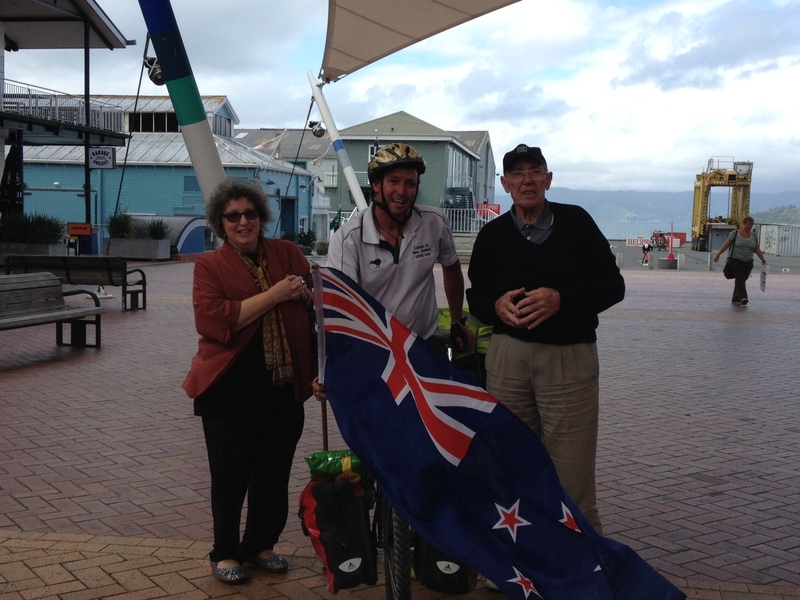 My cousins, Janet and Paul, made the trip down from Auckland. Paul Eagle, a local Wellington City Councillor came down and passed on the Mayor’s apologies because she wasn’t able to make it. We then spent a few hours outside Chicago bar in a relatively nice Wellington afternoon. I only had one beer…………because I still had one more thing to do and that was to cycle up the Brooklyn hill and home. The Dominian Post was there and a photo and story was in Tuesday’s paper. Tvnz wasn’t. 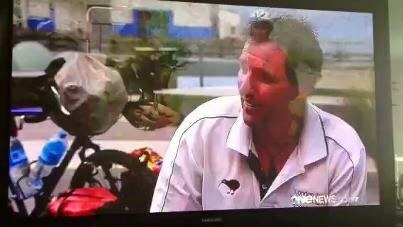 But on Sunday they got me to cycle back into town for a bit of a reinactment and interview and I was then on Sunday’s 6 p.m. national news. My final words are a very big thank you to all of you who have followed and supported me over the past two years. Your constant words of encouragement have lifted me more than you will ever know. I am very appreciative that I have such good family and friends. Whether for good or bad I am sure that I have changed in the last two years. I am not sure I am the same person I was when I left London. One thing I hope is that this won’t be the last of my adventure cycling career. I enjoyed it immensely. It became a very nice lifestyle that will not be easy to give up…………I already have a future adventure planned to add to the 32,664 km from the last trip. I guess I should add that I am very proud after going past the point of no return ( after telling that many people that I had to do it) to have completed exactly what I set out to do……….and to do it with no planes. Only cycling, and boats were a bonus. What now………..perhaps I will try and write that book………….I probably need to keep cycling 500 km a week just to keep fit and stop myself returning to the chubby guy on the bike that cycled out of London on the 2nd April 2011. Great to read your comments. We really enjoyed meeting you and hope you make into Wellington on time tomorrow. Your mum and dad must be getting very excited.